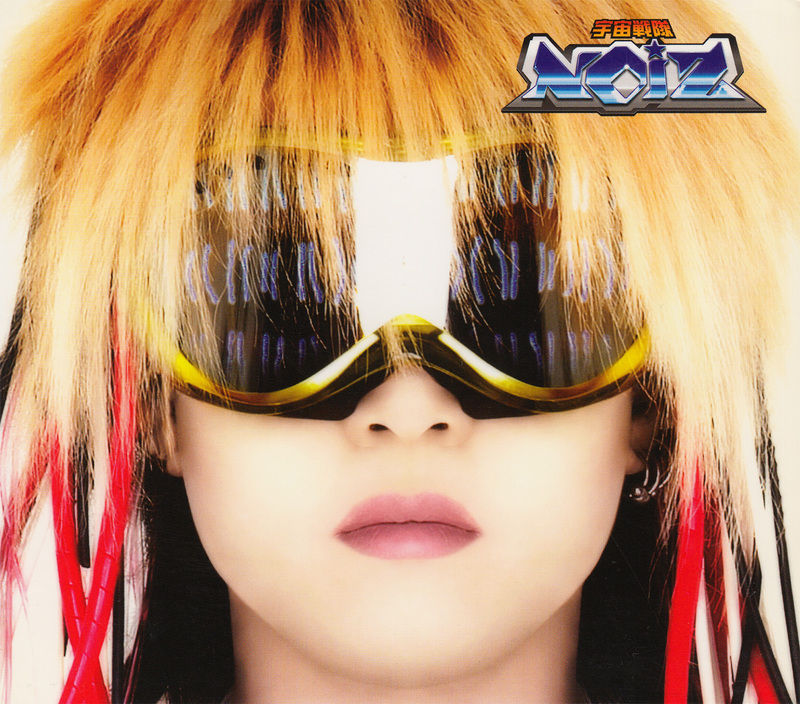 Here you will find all of UCHUSENTAI:NOIZ's single releases. They were rather productive. Nearly each single has one or more non-album "B-sides" plus they once released 13 singles in just one month! 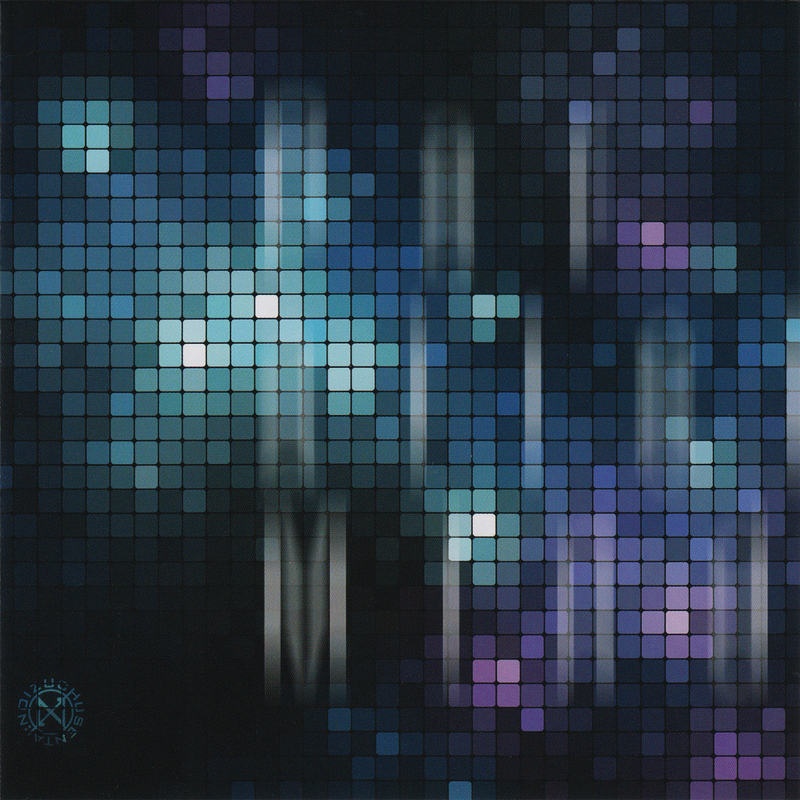 Second single release for 2015 which again features two new songs and two instrumentals. 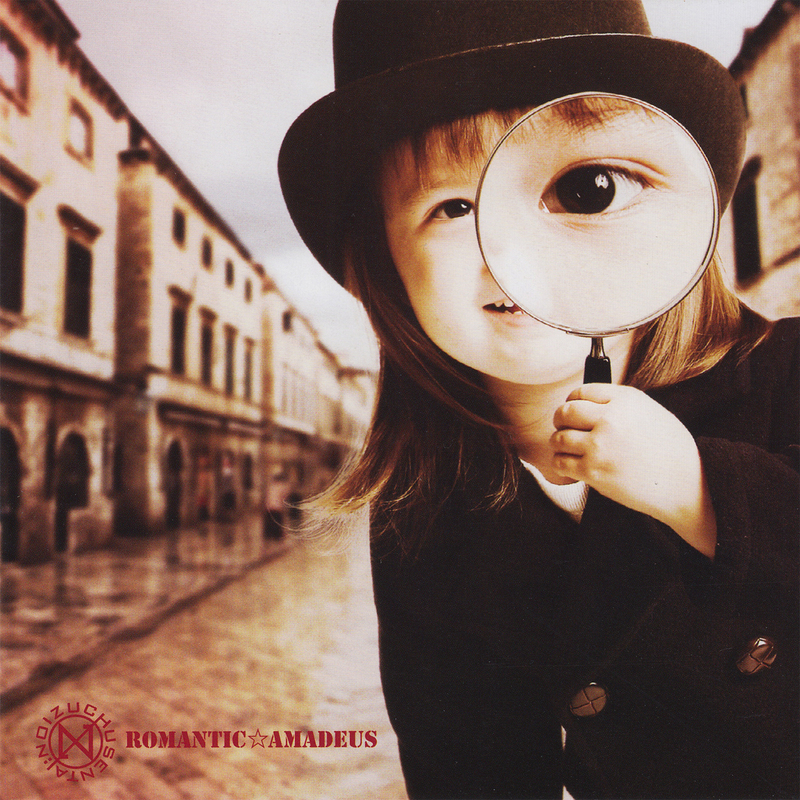 ROMANTIC☆AMADEUS was their first new release for 2015 in the form of a CD-single featuring two new songs and two instrumentals. It comes with a booklet featuring a lot of individual band member photos plus a full band photo. 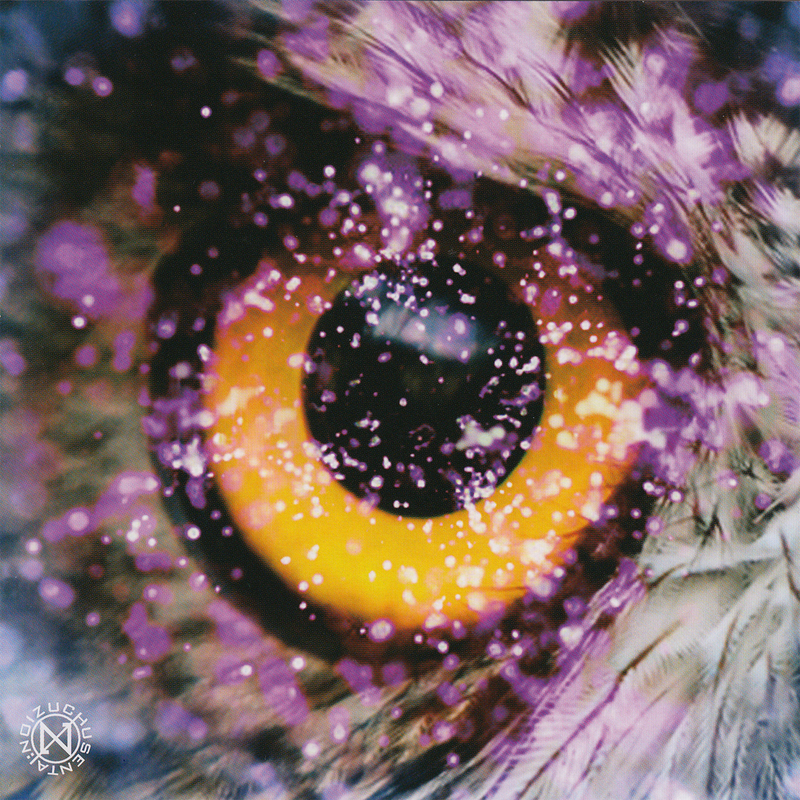 ライカ is the fifth and last single in a serie of 5, released on the 13th of November 2013 as two different editions. 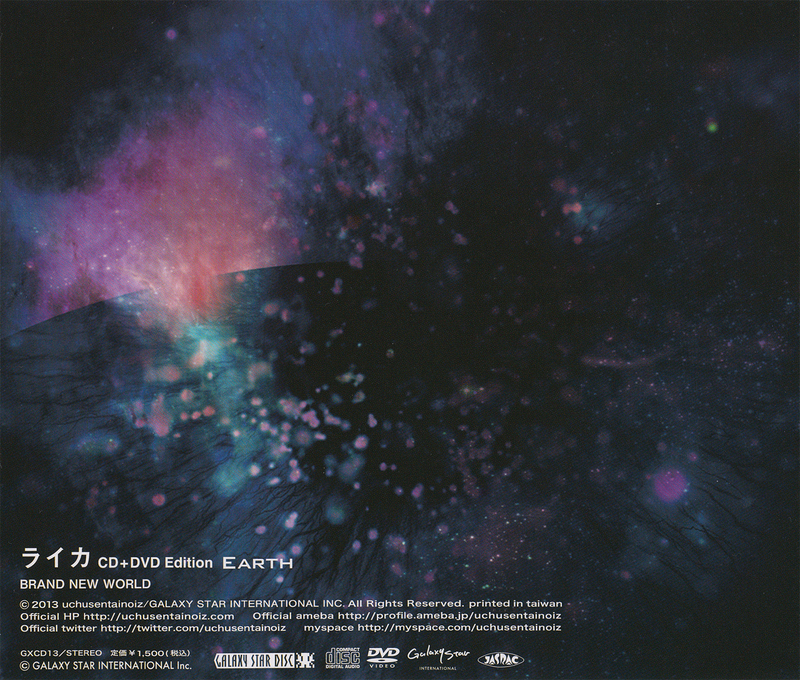 The Earth edition contains the promo video for ライカ and a making of which has a duration of approx 25 minutes. 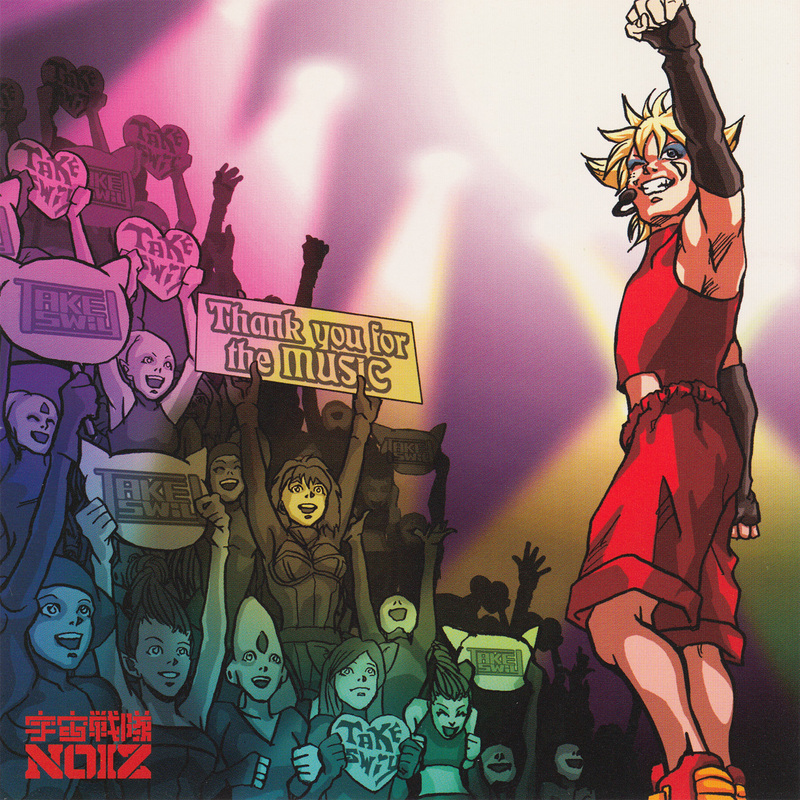 The Cosmo edition contains the fifth part of a concert at North EDSA Skydome in Philippines, recorded on the 23rd of February 2013. 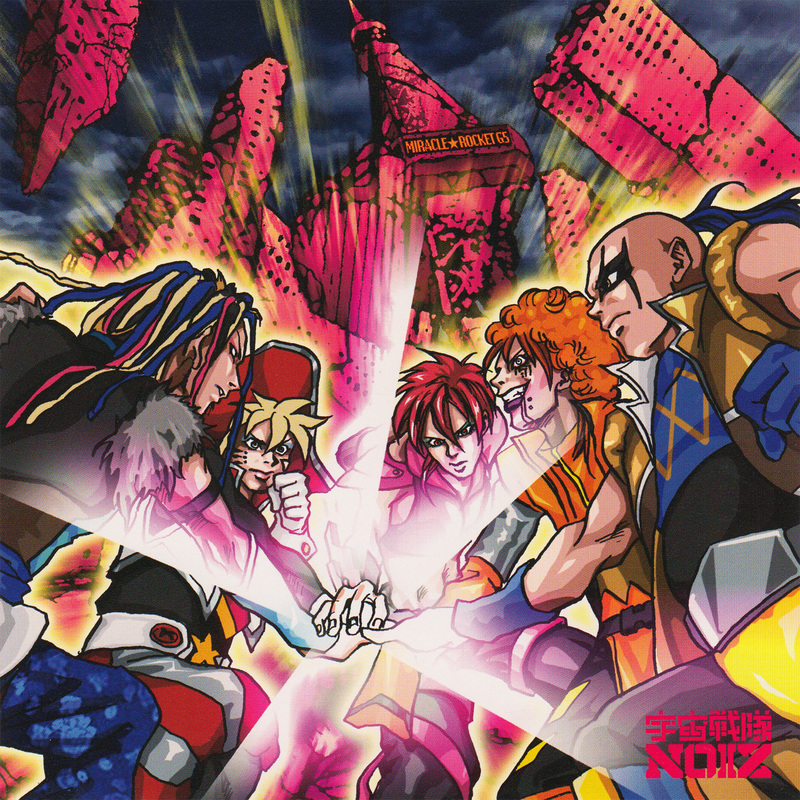 Brand X "Special present DVD"
One Order is the fourth single in a serie of 5, released on the 9th of October 2013 as two different editions. 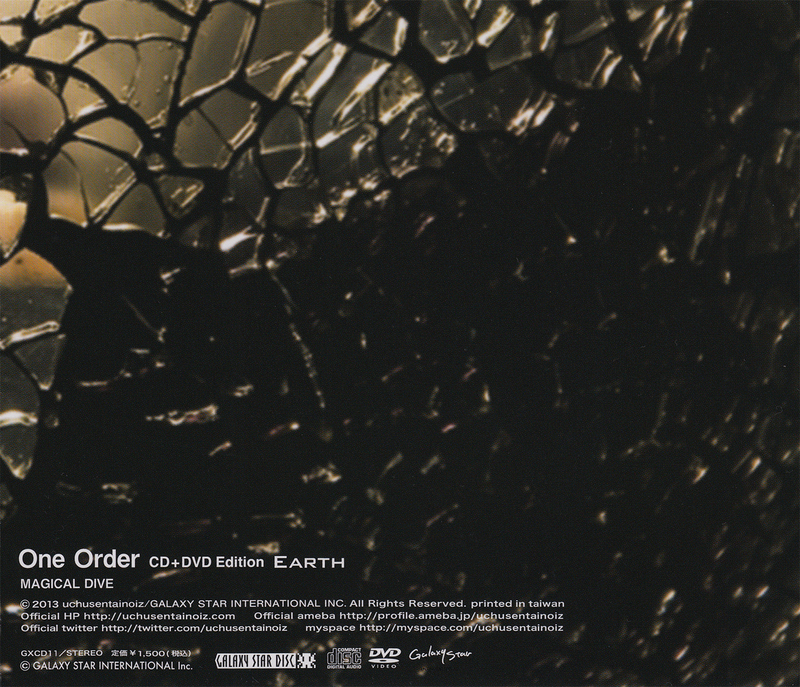 The Earth edition contains the promo video for One Order and a making of which has a duration of approx 25 minutes. 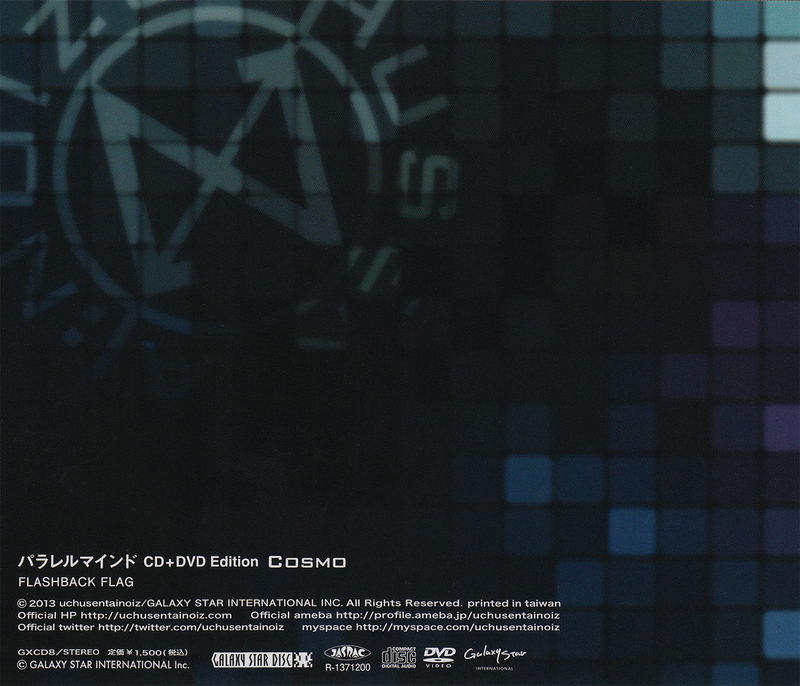 The Cosmo edition contains the fourth part (which lasts 17 minutes) of a concert at North EDSA Skydome in Philippines, recorded on the 23rd of February 2013. 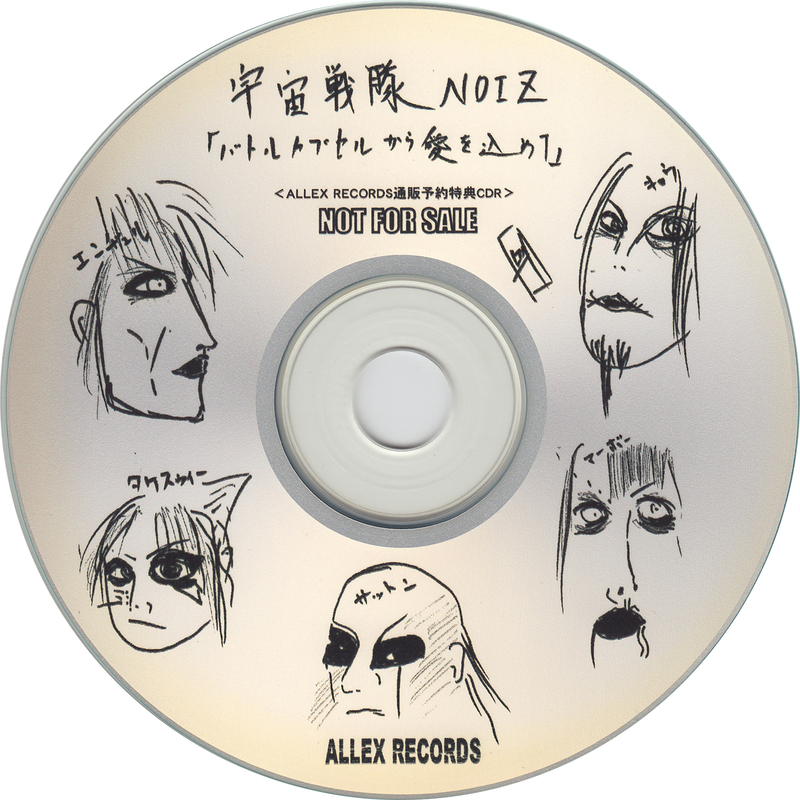 You would get a special DVD when buying a copy of the single at Brand X which features a message from the band that lasts approx 5 minutes. 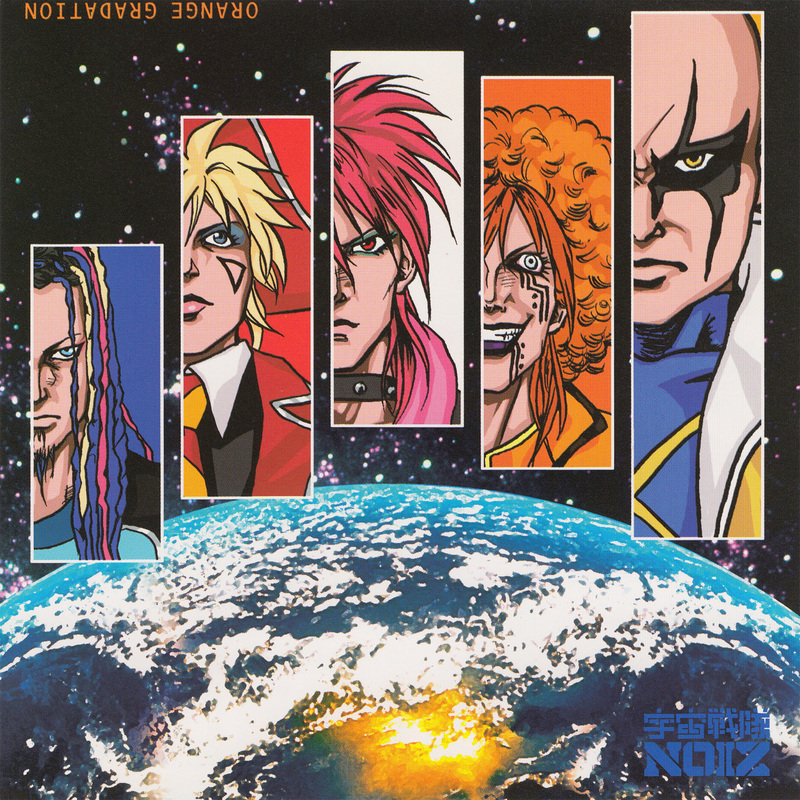 The DVD is a plain disc with no writings and is housed in a plastic sleeve with an insert. コロナ is the third single in a serie of 5, released on the 11th of September 2013 as two different editions. 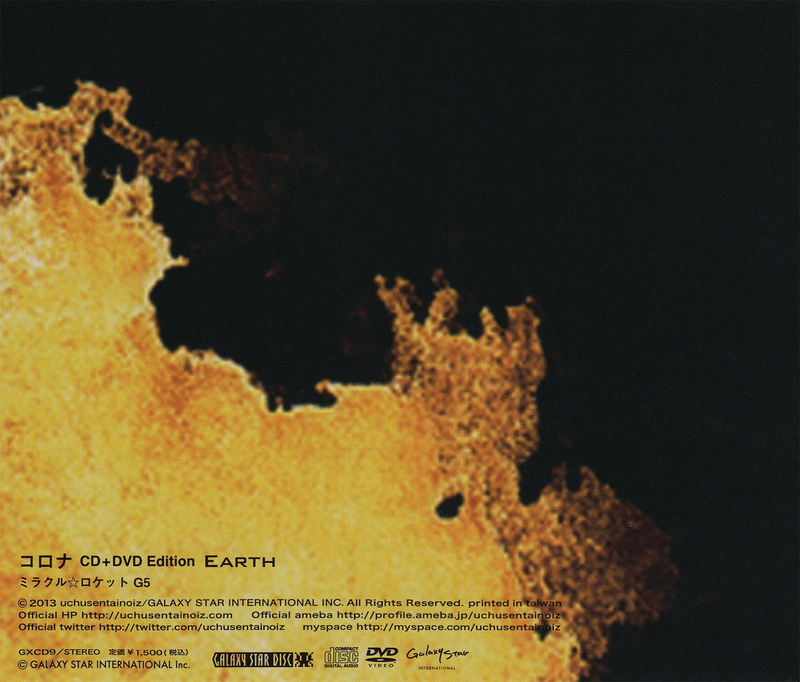 The Earth edition contains the promo video for コロナ and a making of which has a duration of approx 25 minutes. The Cosmo edition contains the third part (which lasts 17 minutes) of a concert at North EDSA Skydome in Philippines, recorded on the 23rd of February 2013. 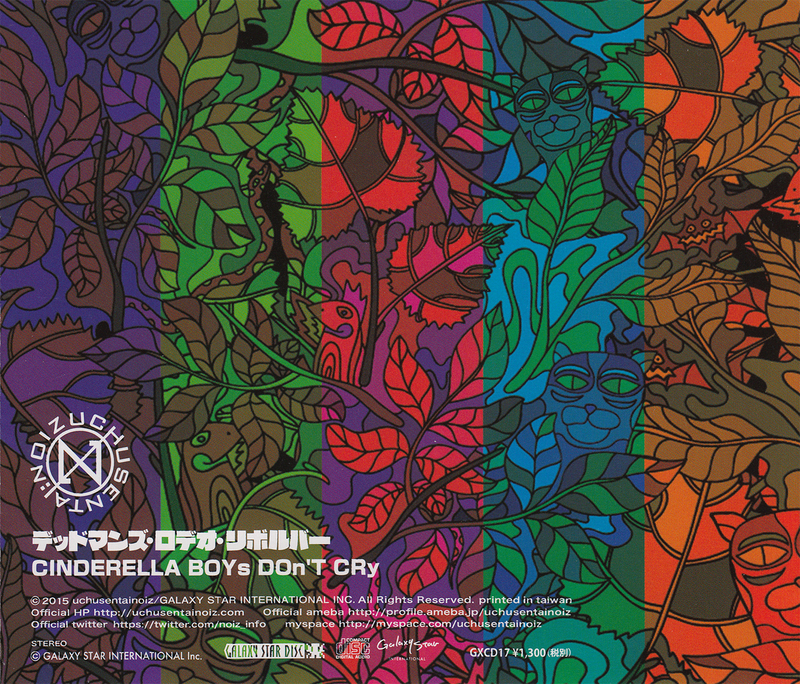 パラレルマインド is the second single in a serie of 5, released in August 2013 as two different editions. 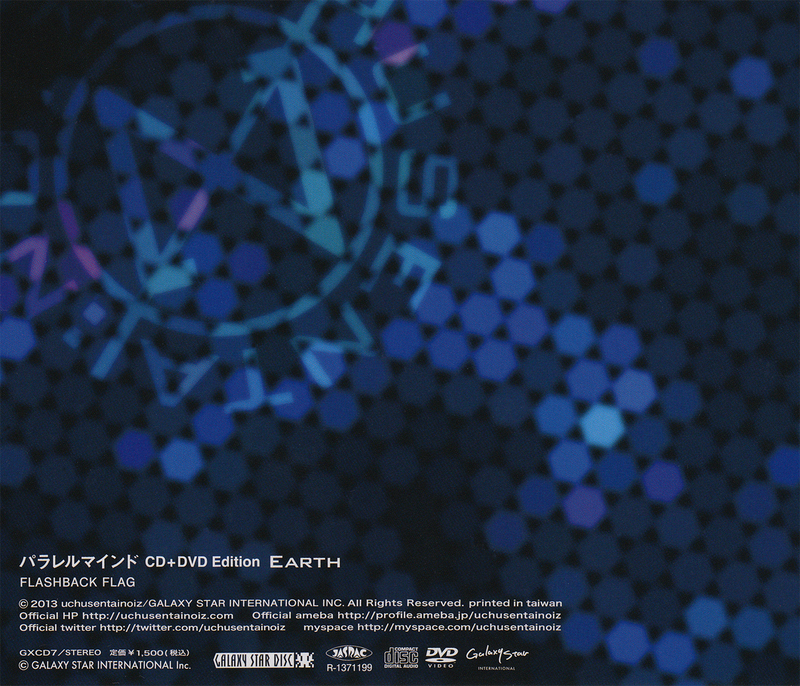 The Earth edition contains the promo video for パラレルマインド and a making of which has a duration of approx 25 minutes. 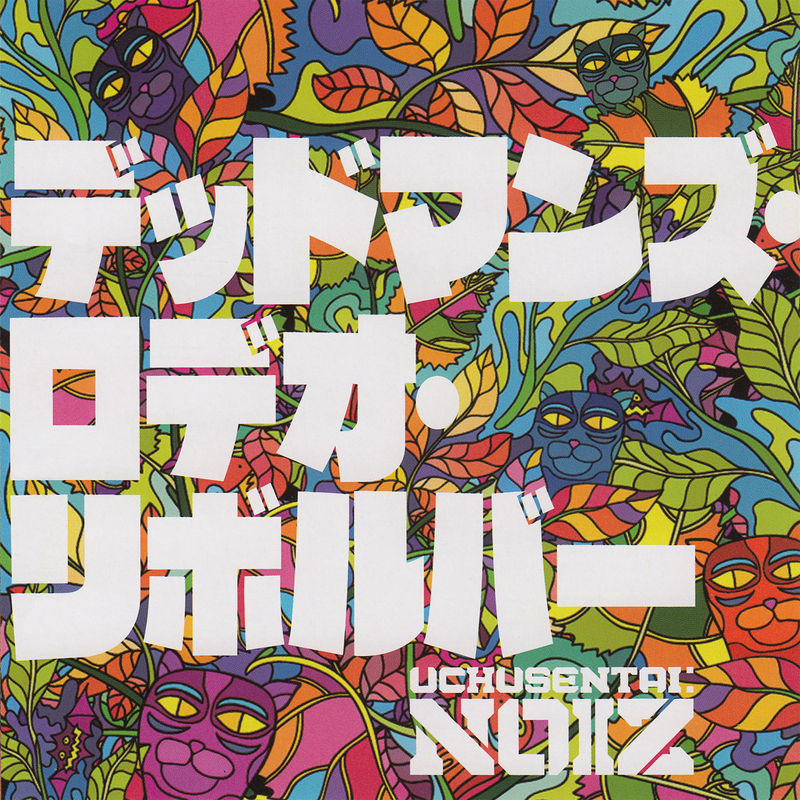 The Cosmo edition contains the second part (which lasts 17 minutes) of a concert at North EDSA Skydome in Philippines, recorded on the 23rd of February 2013. 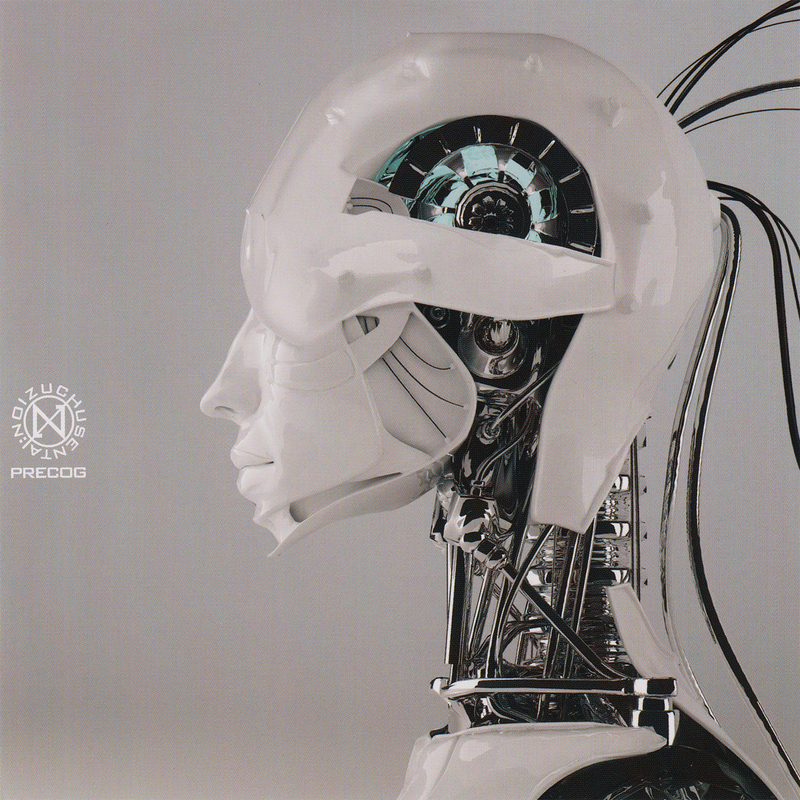 PRECOG is their first single for 2013 and the first one after four years. 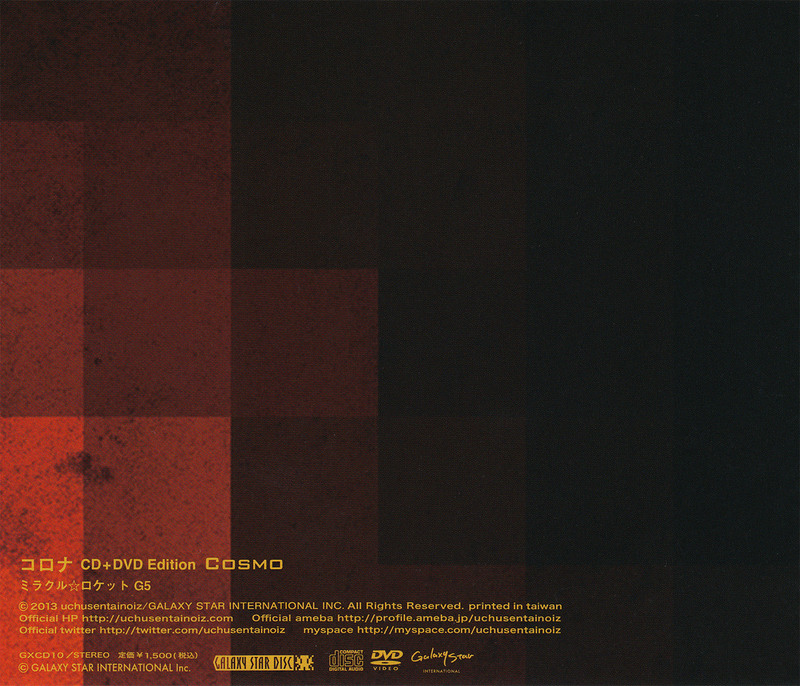 Two editions were released, both come with an obi and both contain a DVD. Each release is supposed to be a limited edtion. 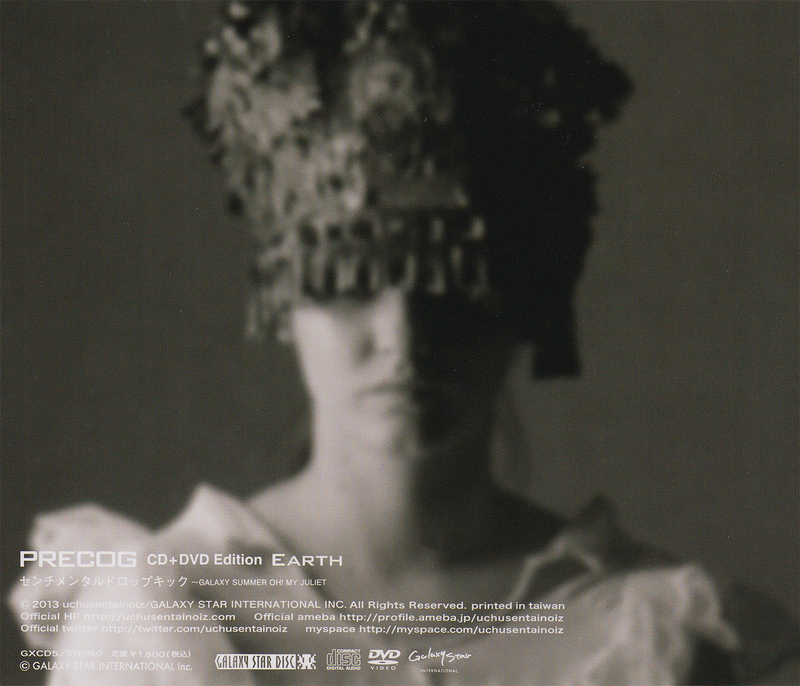 The Earth edition contains the promo video for PRECOG and a making of which has a duration of approx 25 minutes. 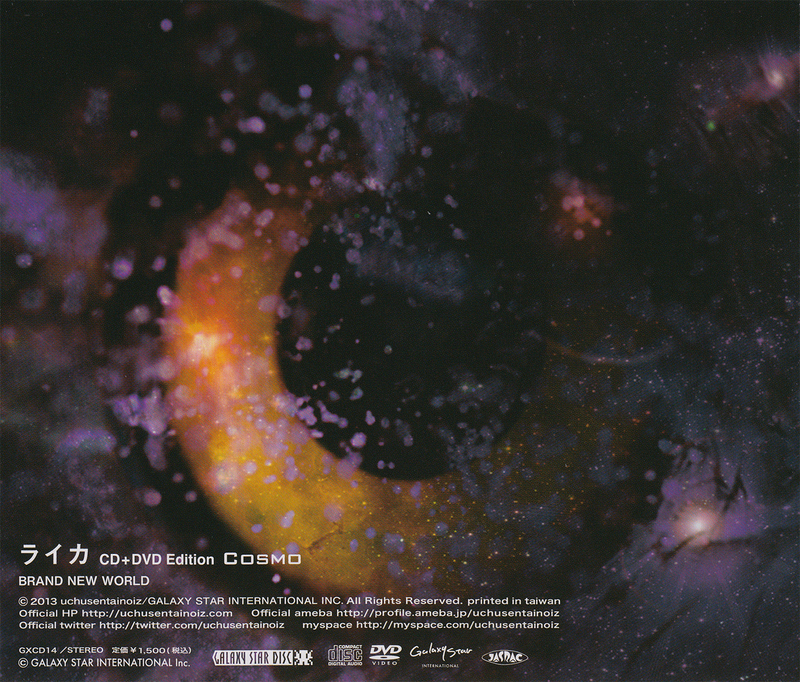 The Cosmo edition contains the first part (which lasts 17 minutes) of a concert at North EDSA Skydome in Philippines, recorded on the 23rd of February 2013. 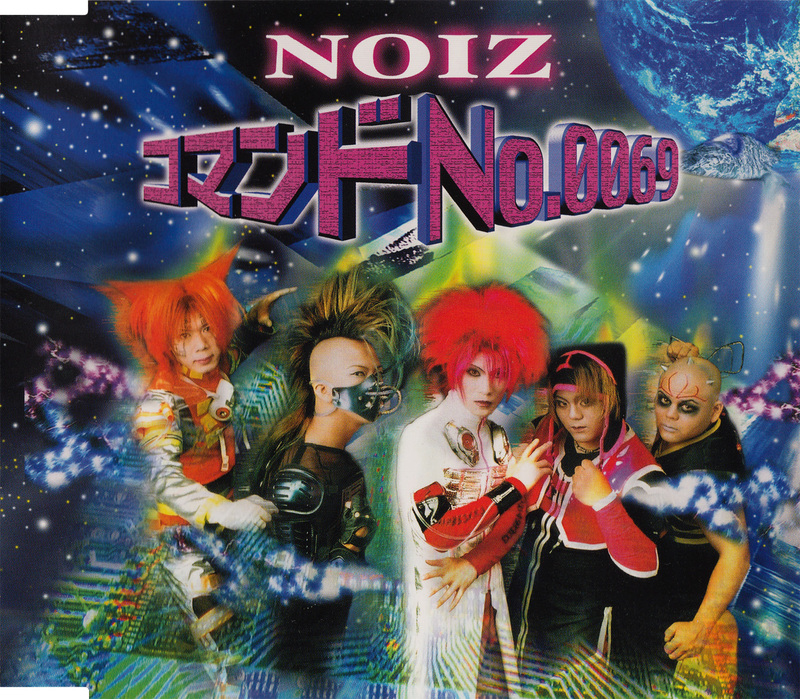 This was their first single release under the name UCHUSENTAI:NOIZ. 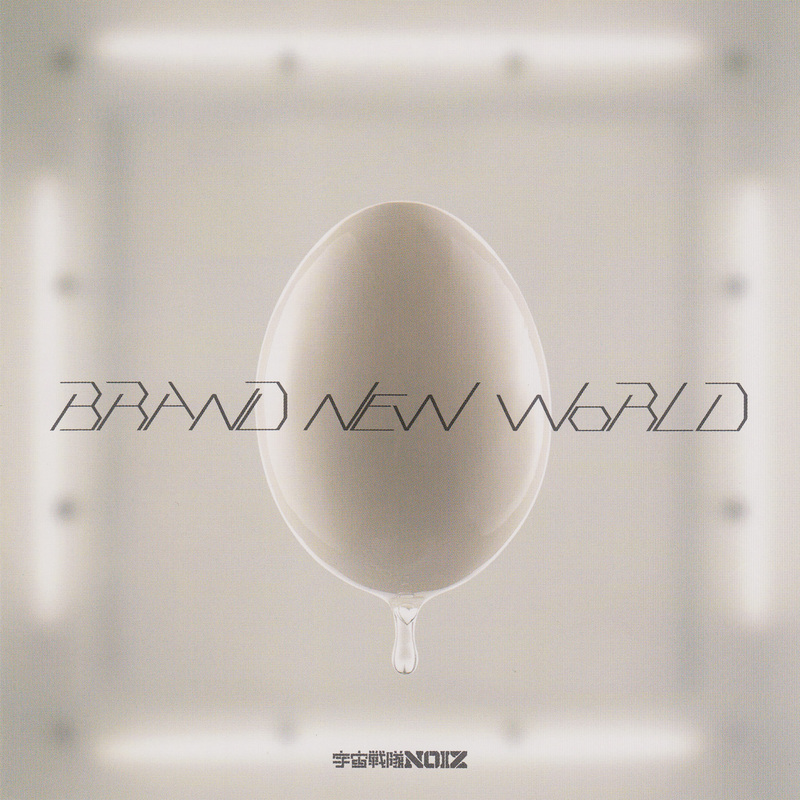 BRAND NEW WORLD was their first single with the new line-up. 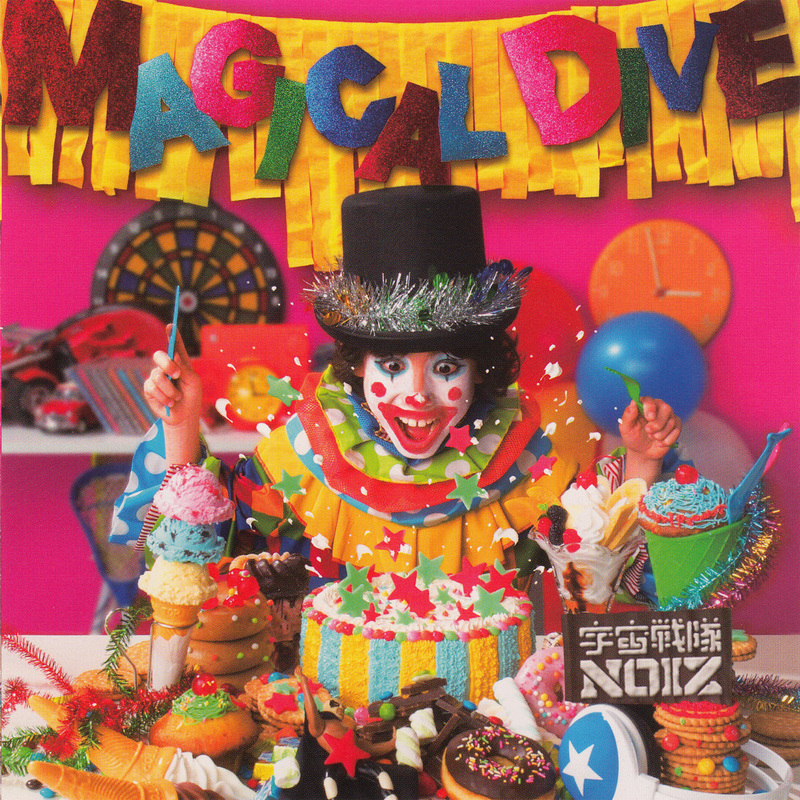 It was released on CD and on CD/DVD. Both releases come with an obi. 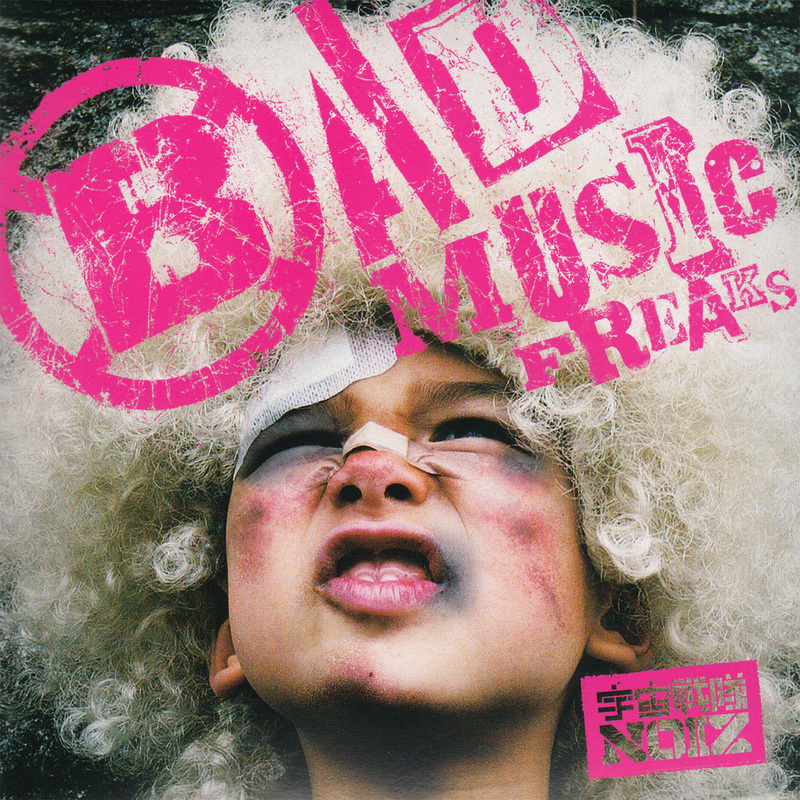 This single was released in August 2008 on CD and as a CD/DVD package. Both releases had an obi. 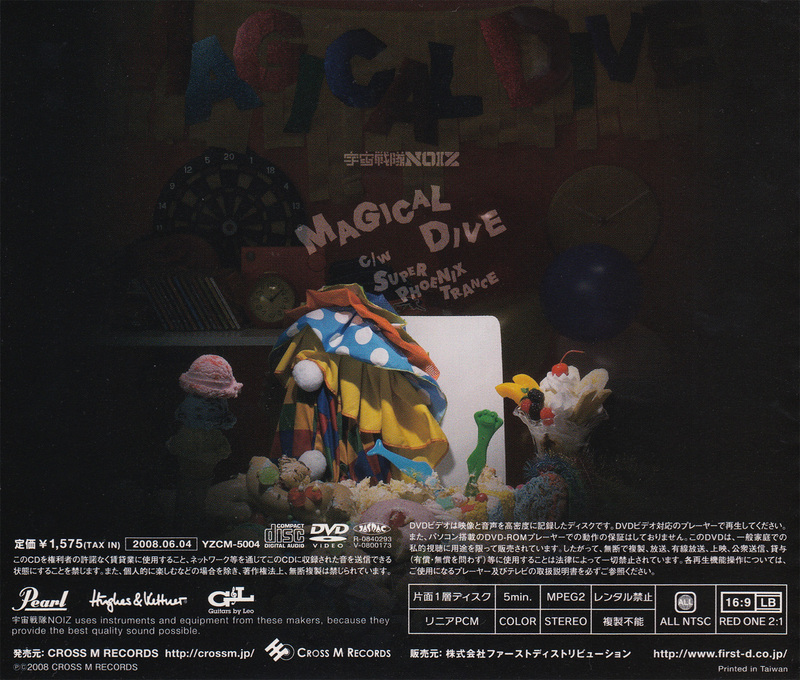 MAGICAL DIVE was released in June 2008 on CD and as a CD/DVD package. Both releases had an obi. 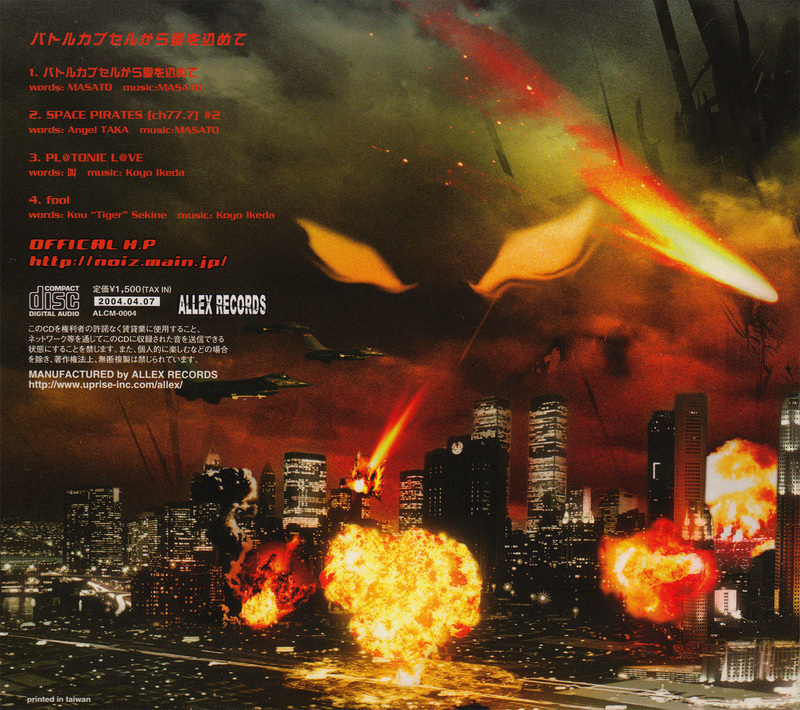 The front sleeve was the same for both releases, though the back sleeve has some minor differences. The prints on the discs are different for both releases as well. 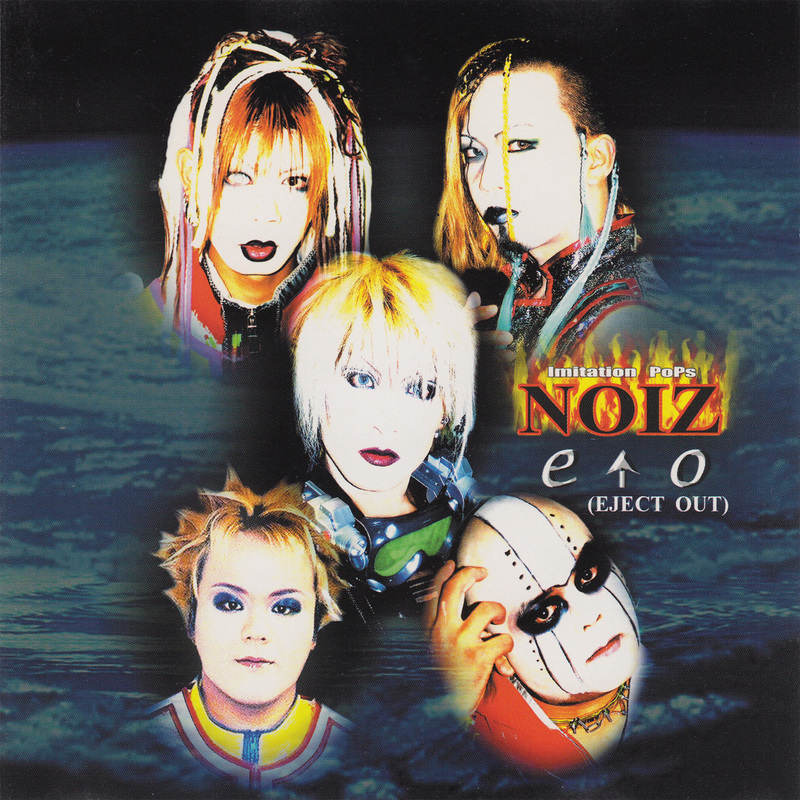 Their first release under the bandname 宇宙戦隊NOIZ. 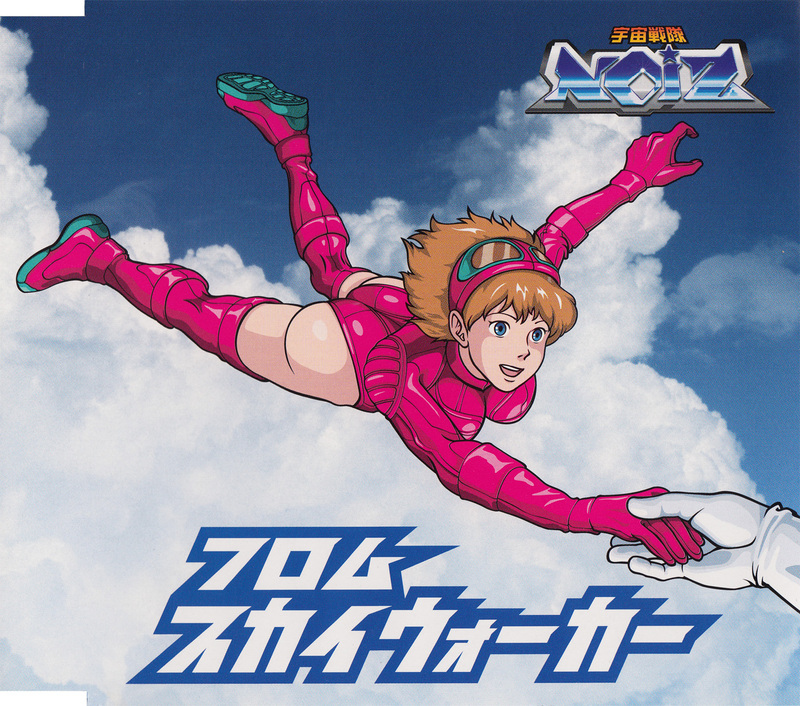 This single was released on CD with an obi. 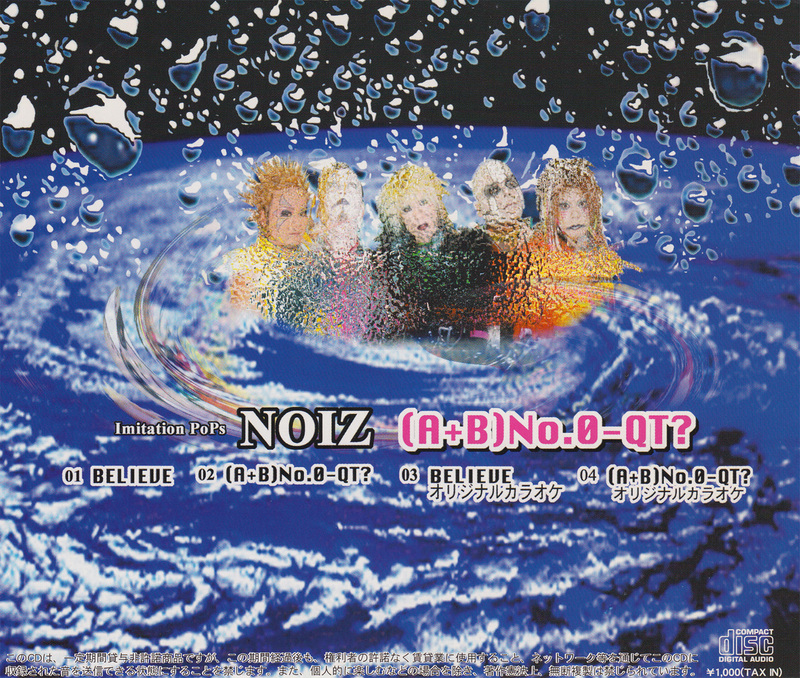 A promotional SPECIAL COMMENT CD-R exists to promote the release. It comes without any artwork. If you have a copy for sale then please drop me a message! 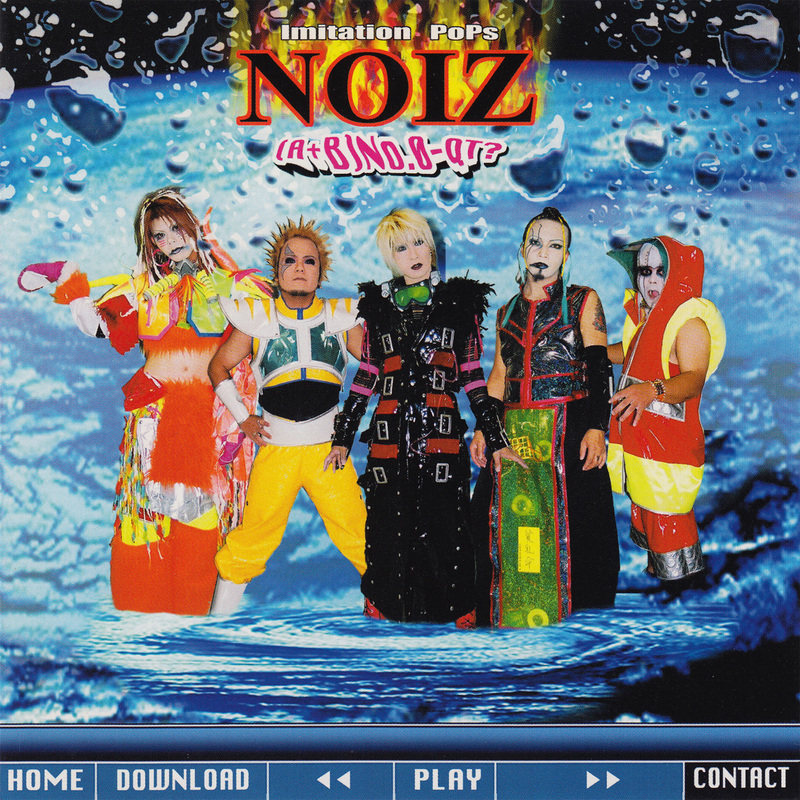 This is the last release that was done under their bandname Imitation PoPs 宇宙戦隊NOIZ. 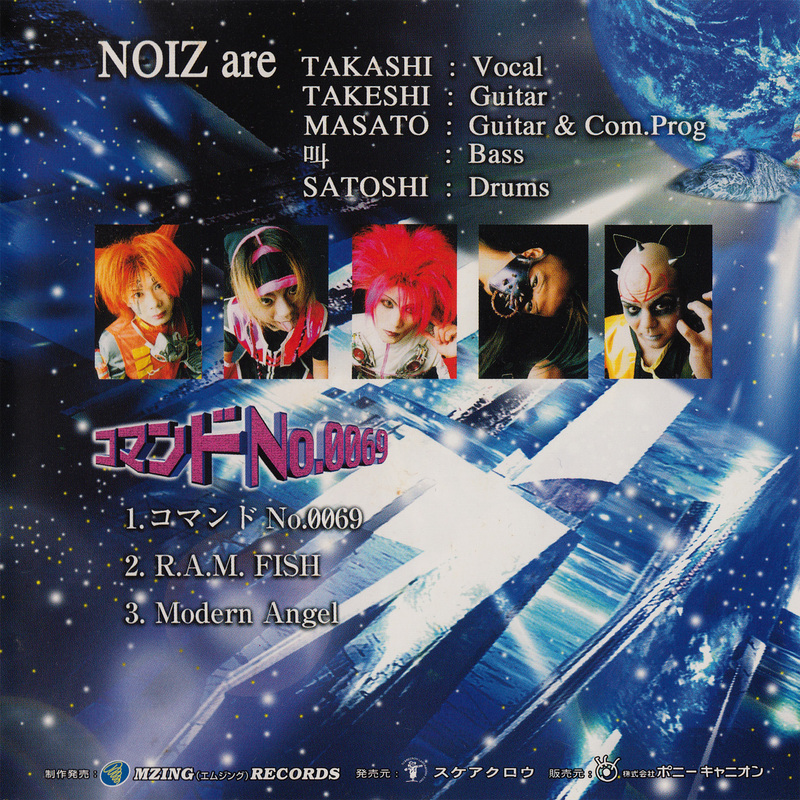 All releases after this single were released as 宇宙戦隊NOIZ. 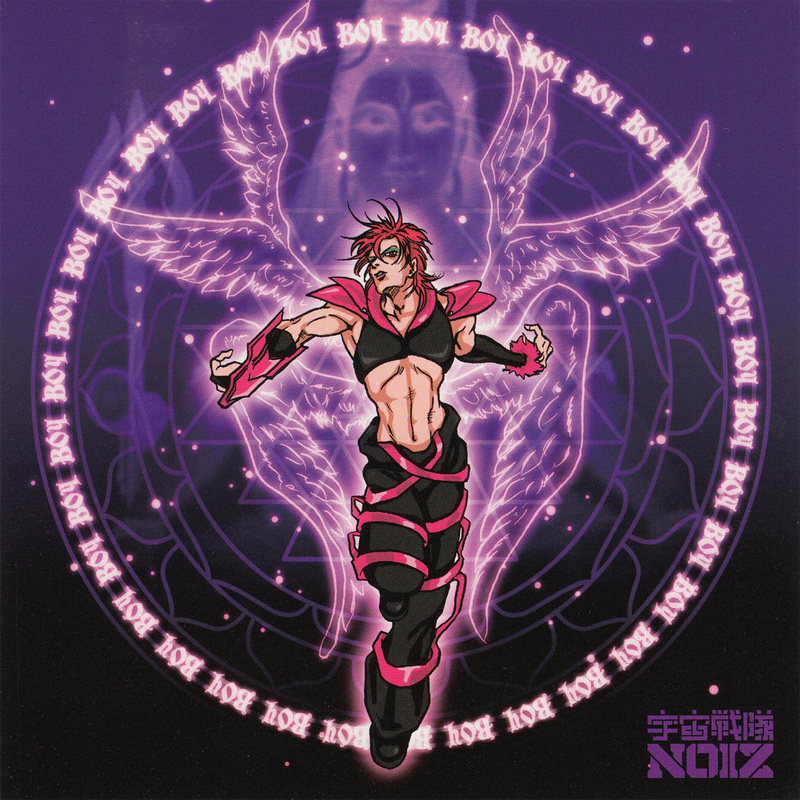 This single was released on CD in a slim jewelcase with an obi. 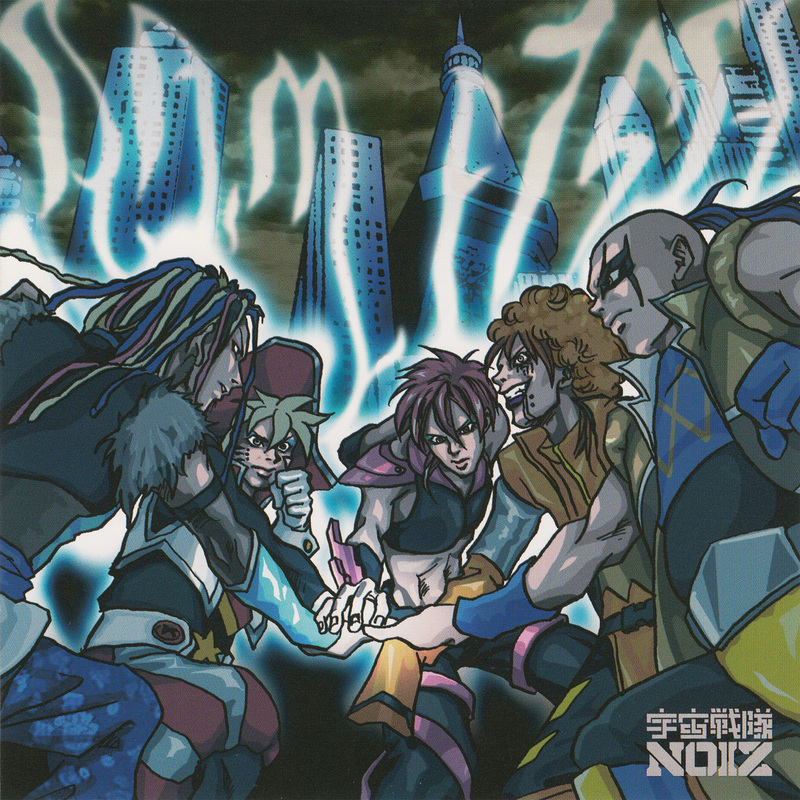 The version featured on this single is an edit. 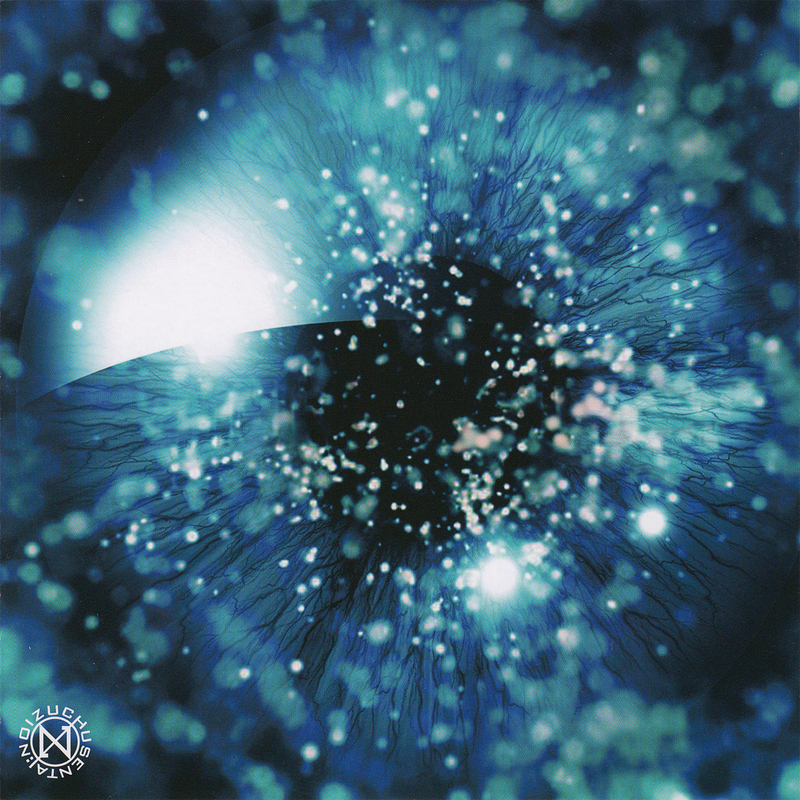 The full length version can be found on the album TERRA. In September 2006 a major tour was undertaken in Japan called JAPAN TOY'S PANIC FESTIVAL 2006 Concrete Jungle Survivor!! M-32. This was a tour of 32 days at 32 different venues starting on the 1st of September and ending on the 1st of October. 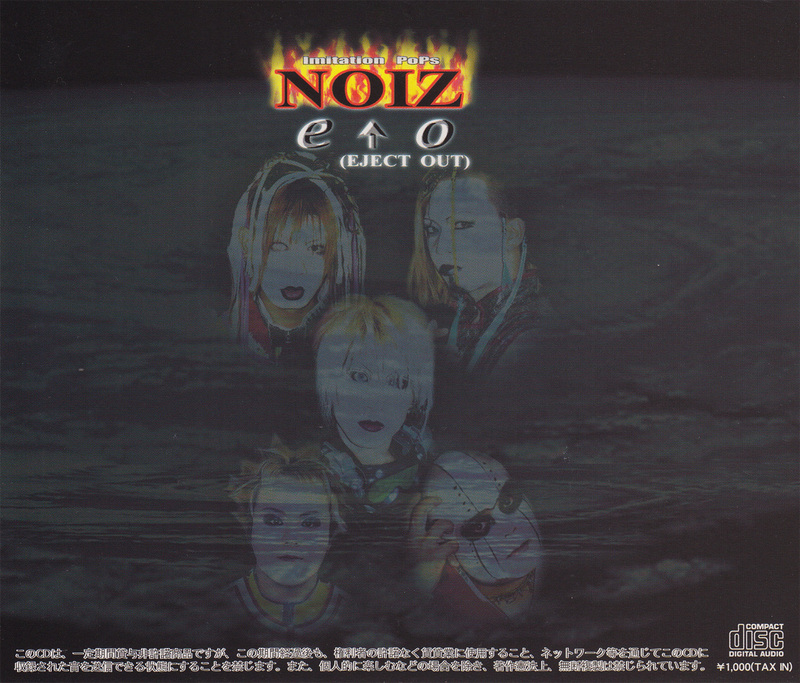 In order to celebrate this or to give it more attention, 13 CD singles were released every two or three days, each featuring new or re-recorded tracks sung in English. 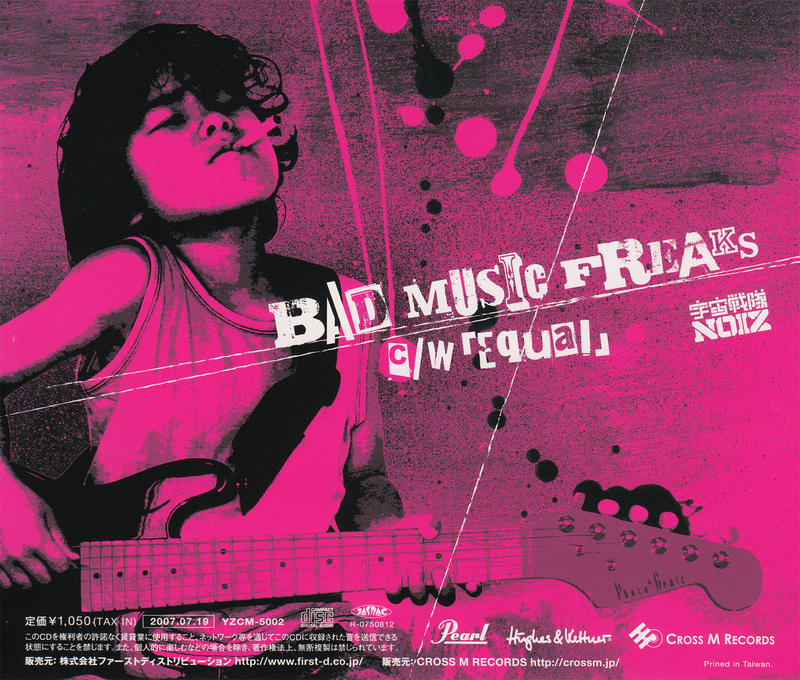 The additional second track is always a short sketch with Angel-TAKA that starts with the same intro music. Each track lasts around 30 to 60 seconds. 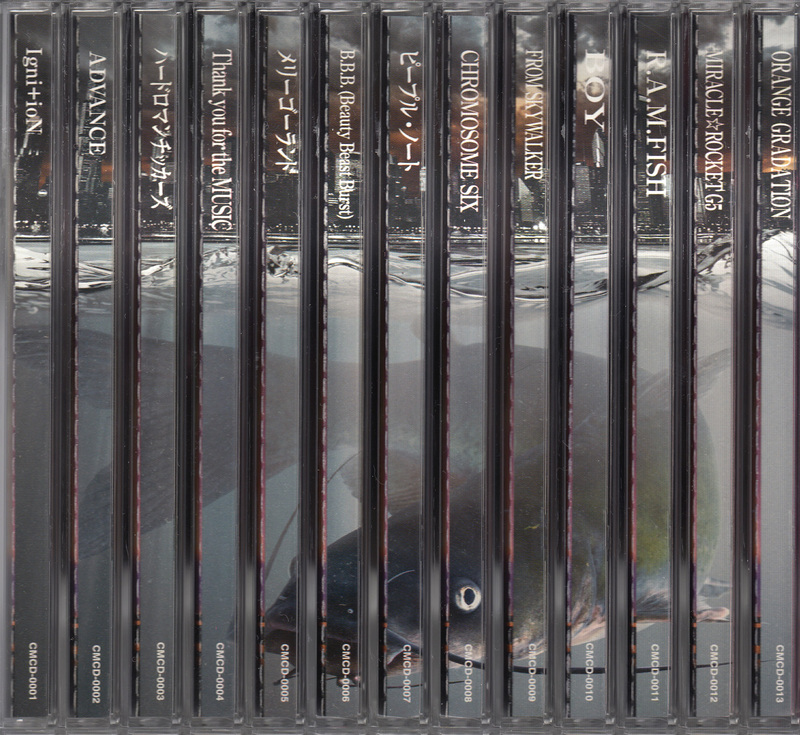 At the left you can see an image of all 13 obis alligned next to each other which will form the full M-32 logo and an image of a fish which is formed when placing all the CD's next to each other without the obis. Scroll down to see each release listed separately. The final single out of 13 for the M-32 Tour. ORANGE GRADATION was later released on the 2007 TERRA album. Click here for more information about the M-32 singles serie. The twelfth single out of 13 for the M-32 Tour. 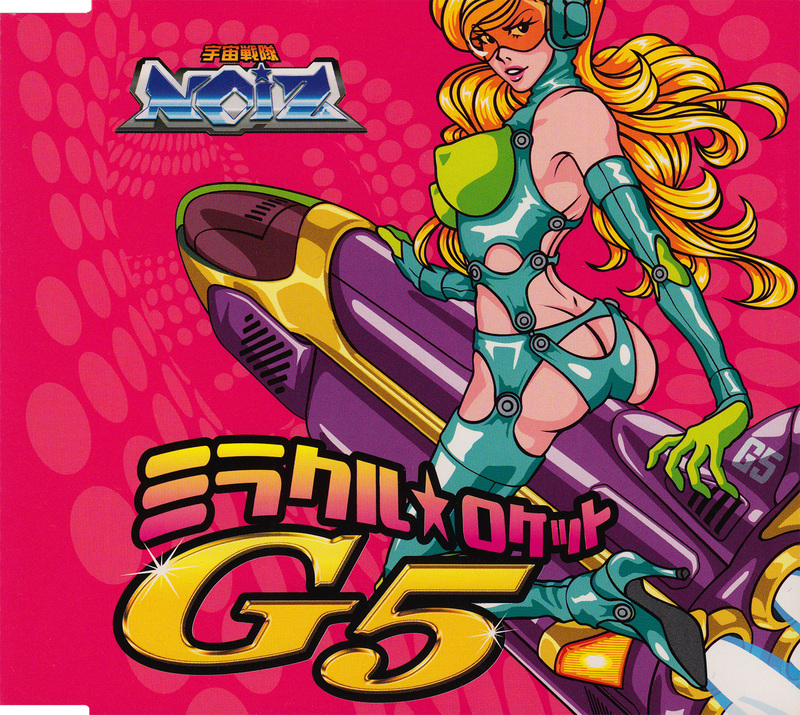 MIRACLE☆ROCKET G5 is an English version of ミラクル☆ロケットG5 which was originally released on the EGO-style album. 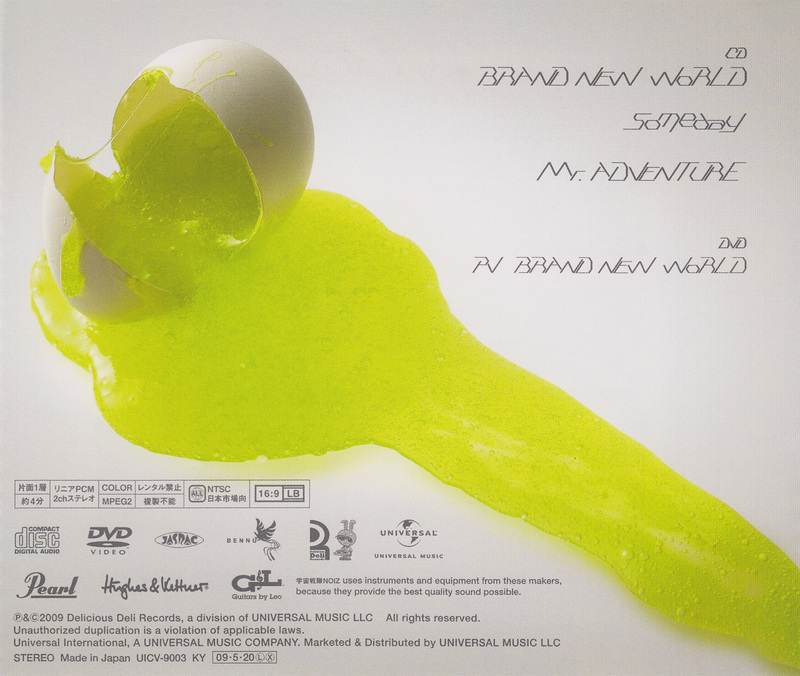 The eleventh single out of 13 for the M-32 Tour. R.A.M.FISH is an English version which was originally released on the サイボーグロックショウ完全盤 album. The tenth single out of 13 for the M-32 Tour. BOY was later released on the 2007 TERRA album. The ninth single out of 13 for the M-32 Tour. FROM SKYWALKER is an English version of フロムスカイウォーカー which was originally released on the EGO-style album. 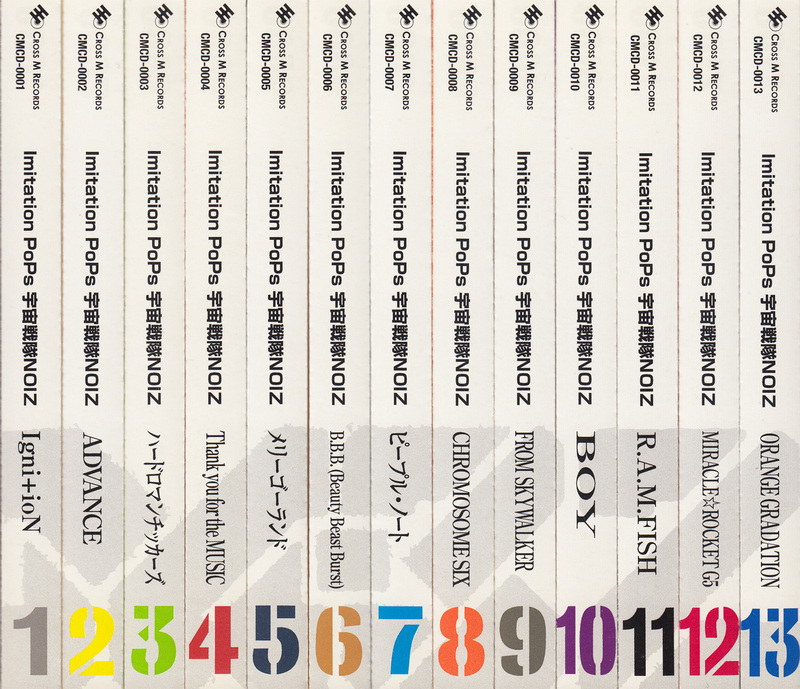 The eight single out of 13 for the M-32 Tour. CHROMOSOME SIX is an English version which was originally released on the ゼロの系譜 album. The seventh single out of 13 for the M-32 Tour. 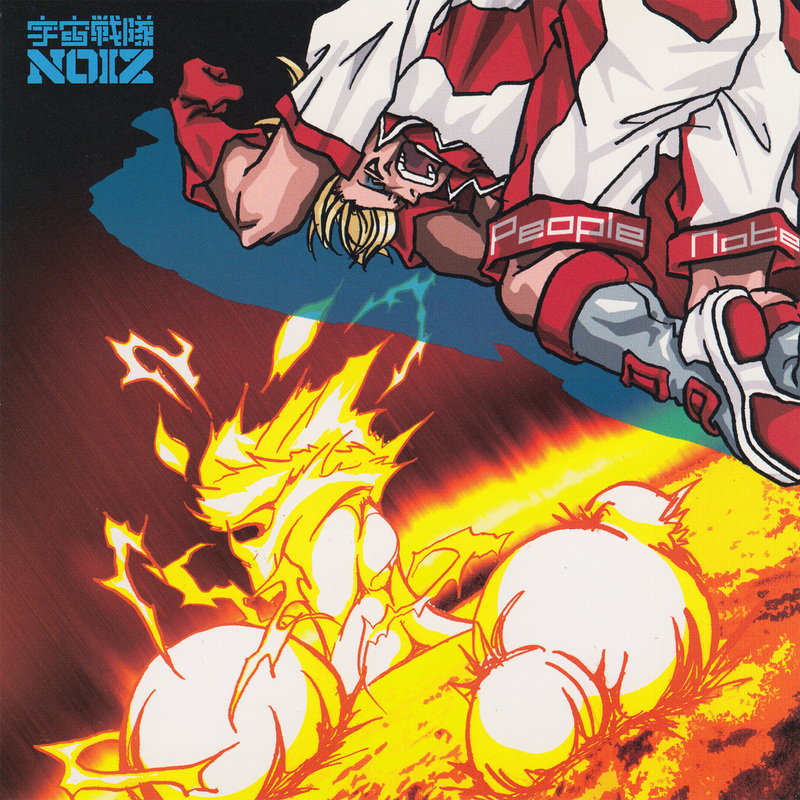 ピープル・ノート was later released on the 2007 TERRA album. 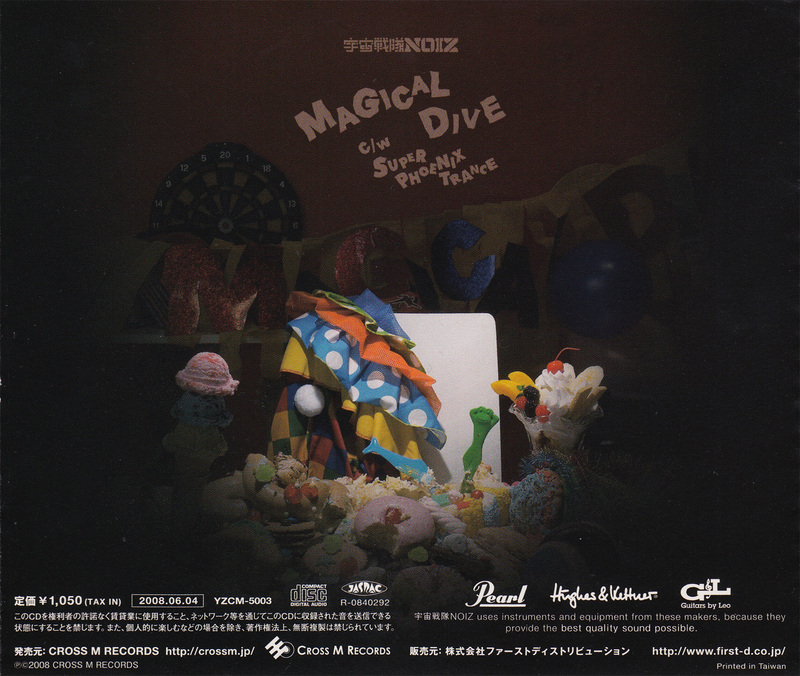 The sixth single out of 13 for the M-32 Tour. 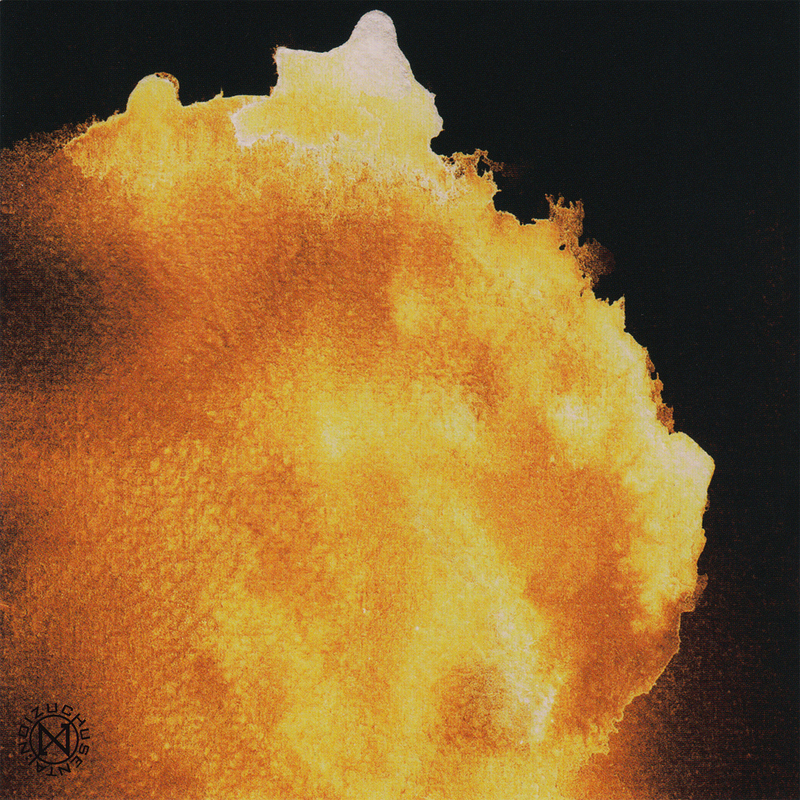 B.B.B. 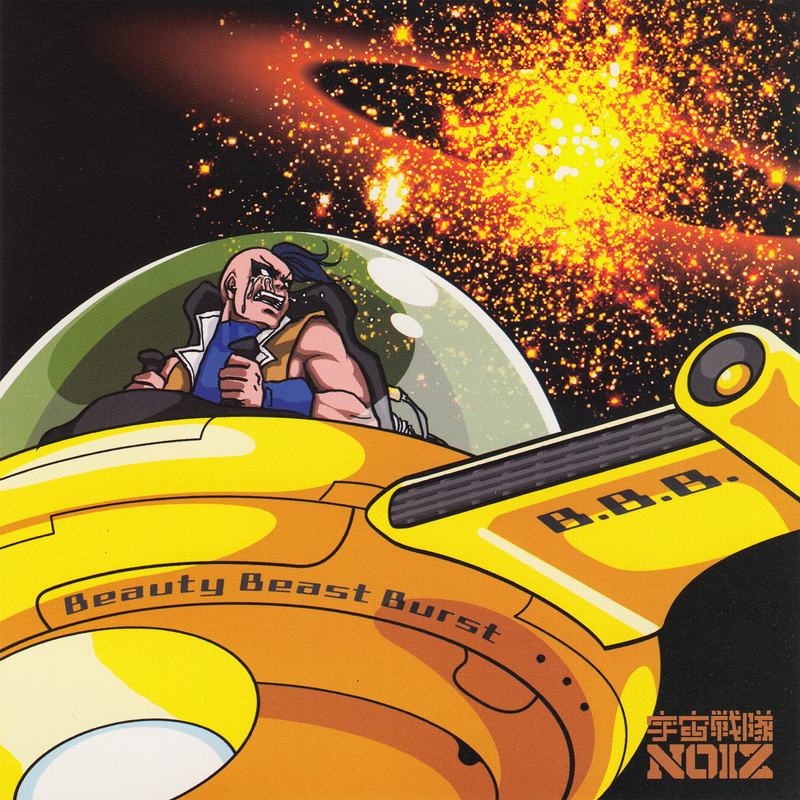 (Beauty Beast Burst) was later released on the 2007 TERRA album. The fifth single out of 13 for the M-32 Tour. 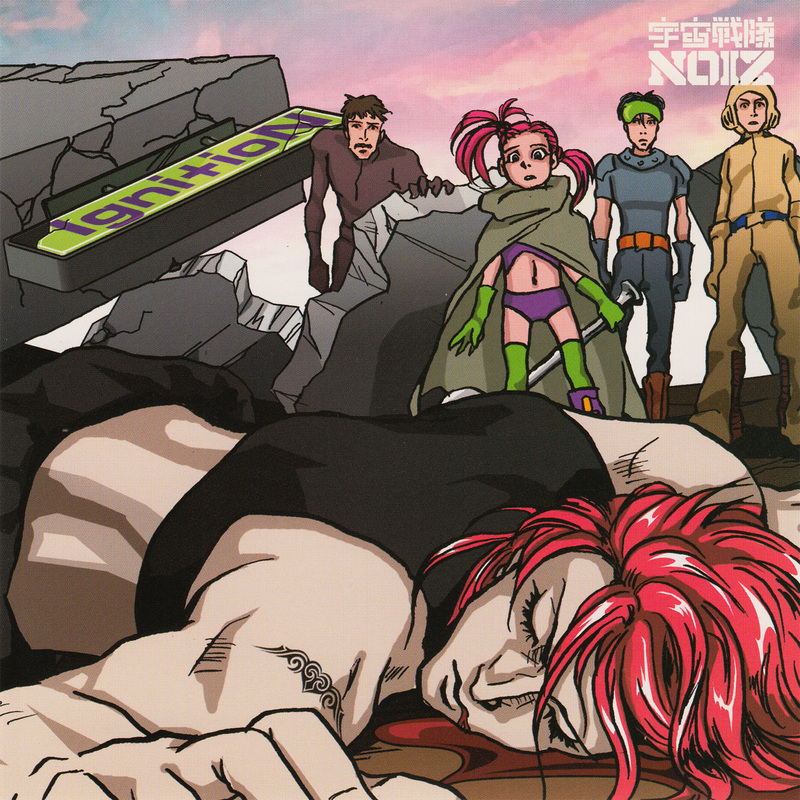 メリーゴーランド was later released on the 2007 TERRA album. 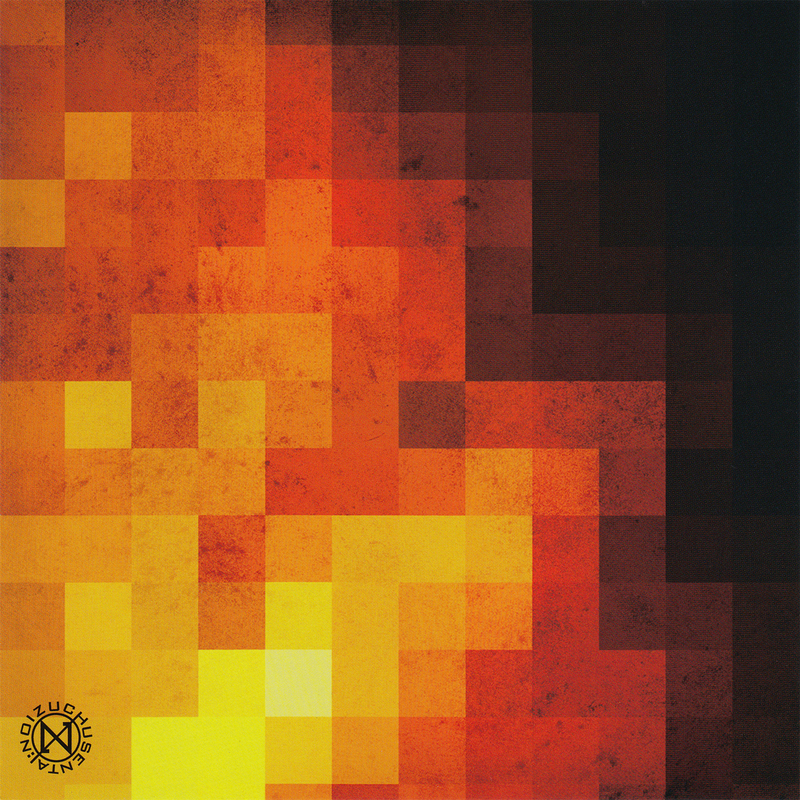 The forth single out of 13 for the M-32 Tour. Thank you for the MUSIC is an English version which was originally released on the EGO-style album. The third single out of 13 for the M-32 Tour. 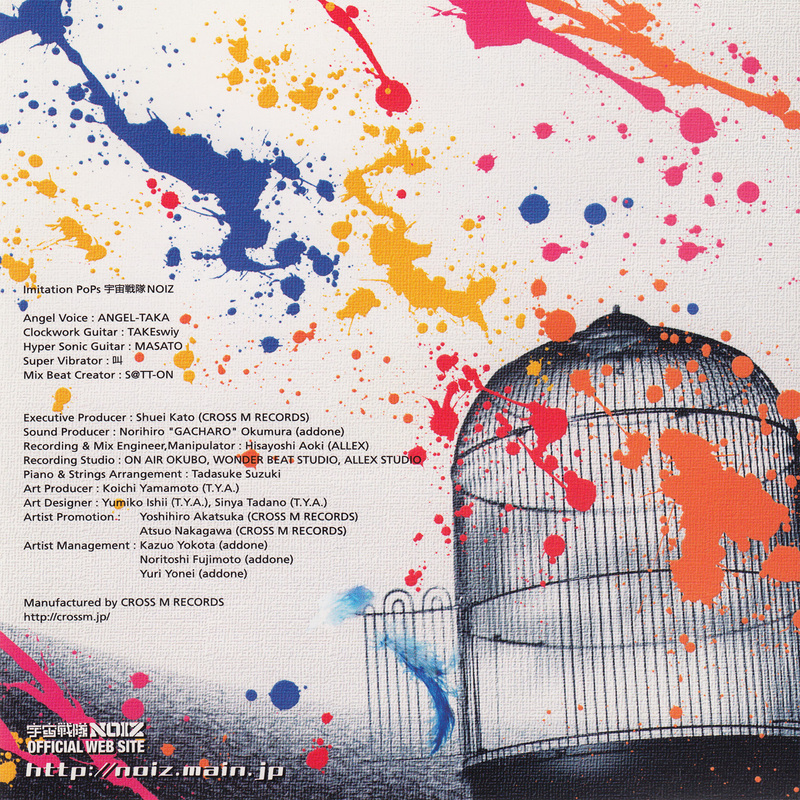 ハードロマンチッカーズ was later released on the 2007 TERRA album. The second single out of 13 for the M-32 Tour. ADVANCE is an English version which was originally a B-side from the 2004 宇宙戦隊プラズマ☆アミューズメント single. The first single out of 13 for the M-32 Tour. 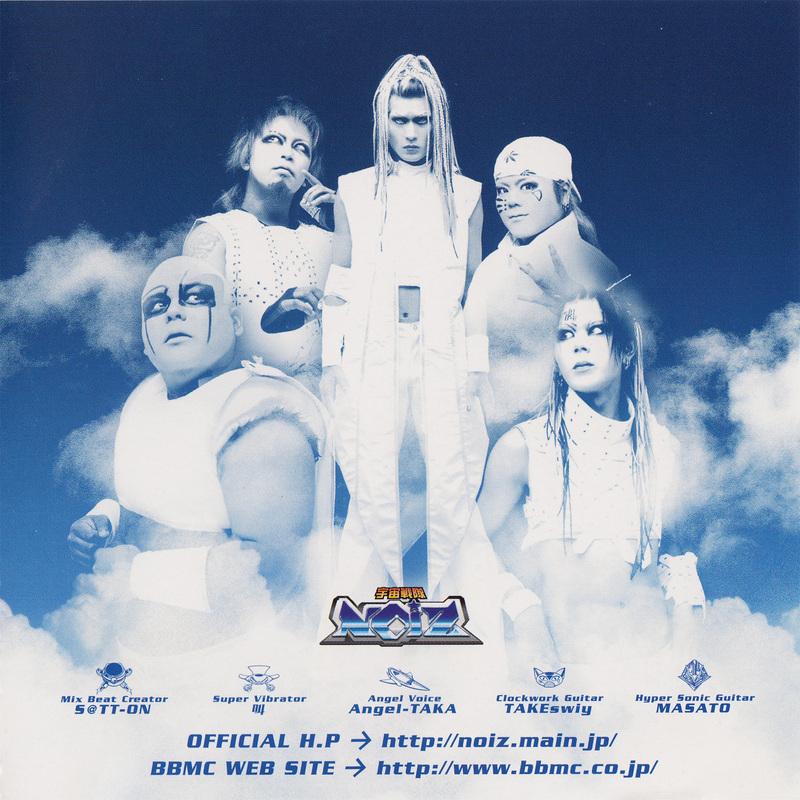 Igni+ioN is an English version which later also appeared on GREAT ROCK'N'ROLL HEROES. 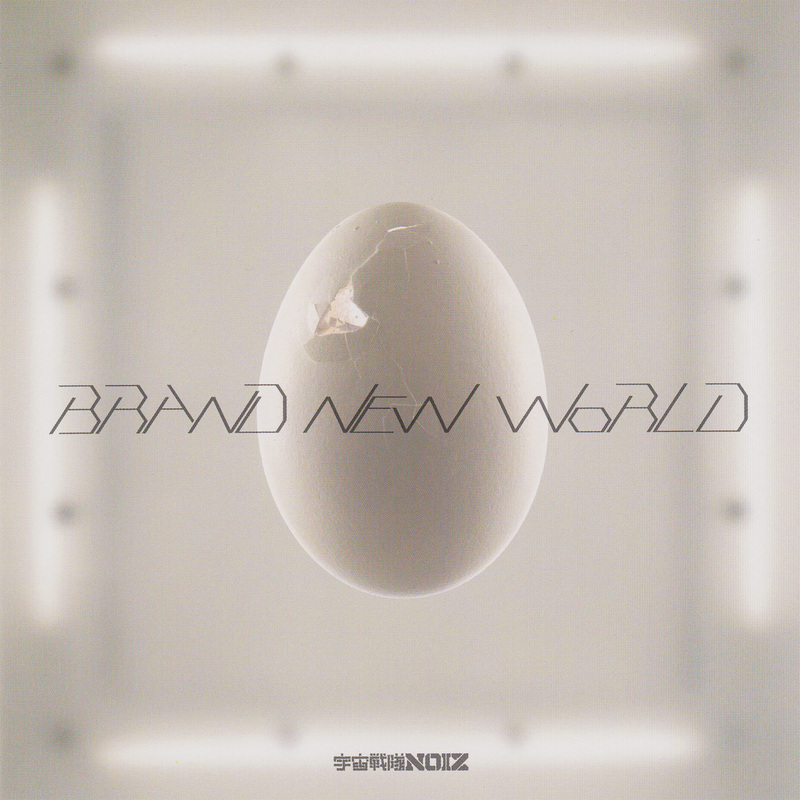 The second single from the album EGO-style. 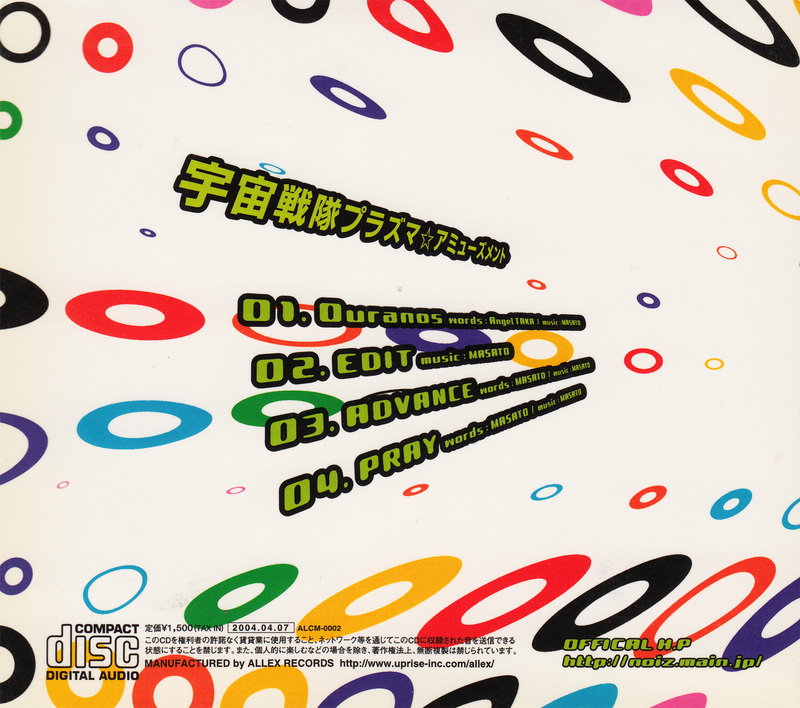 It was released on CD with an obi in a slim jewelcase. Their first single from the, then, yet to be released EGO-style album. It was released on CD with an obi in a slim jewelcase. 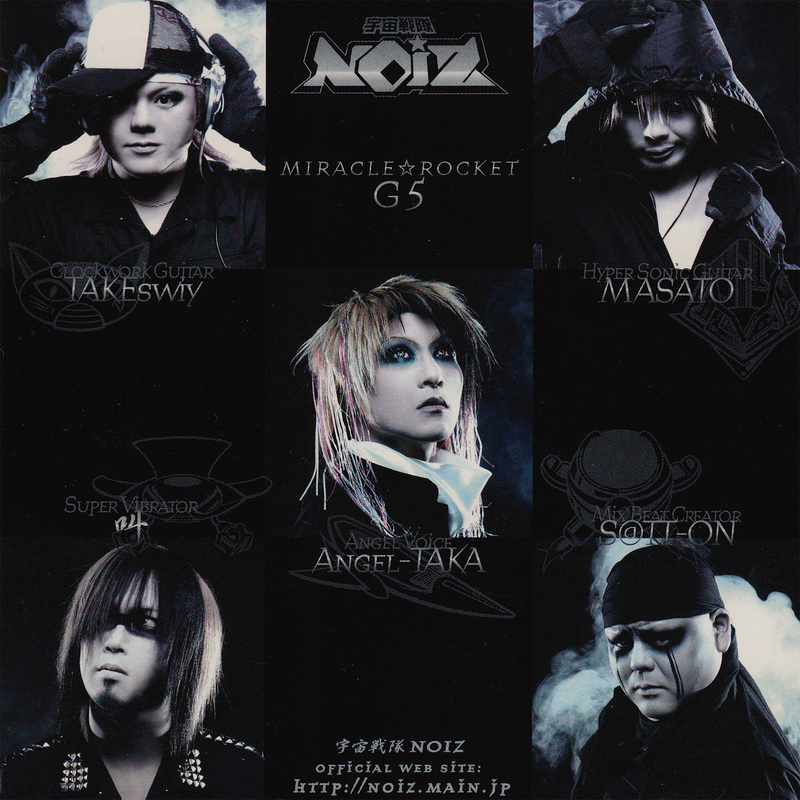 A special edition was released on the 29th of April with different artwork, obi and an English title (MIRACLE☆ROCKET G5) which was sold on this day at this concert only during the JAPAN TOY'S PANIC TOUR 2005. 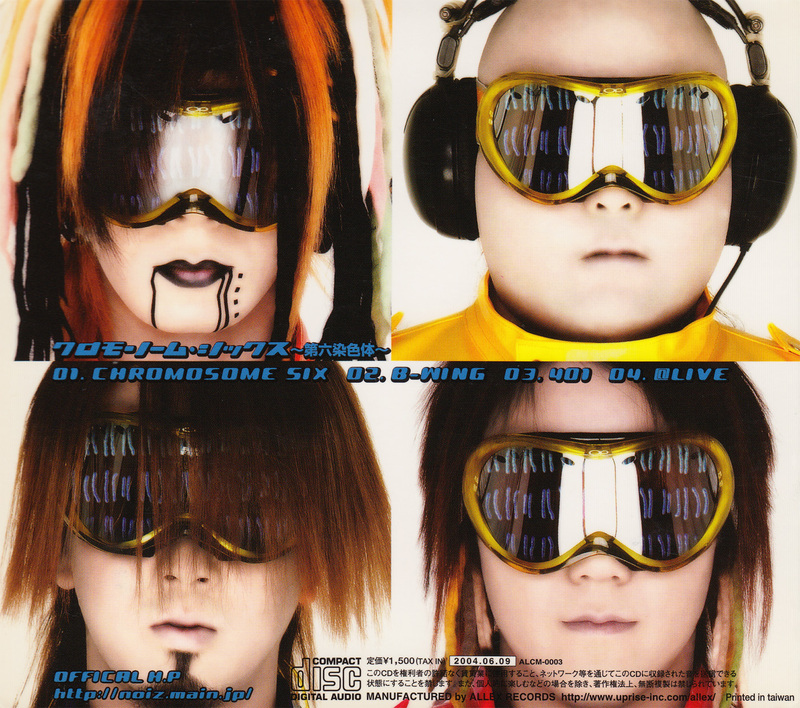 Third single released from their second album, issued on CD with an obi, as a digi-pack and has a small poster with images and lyrics. 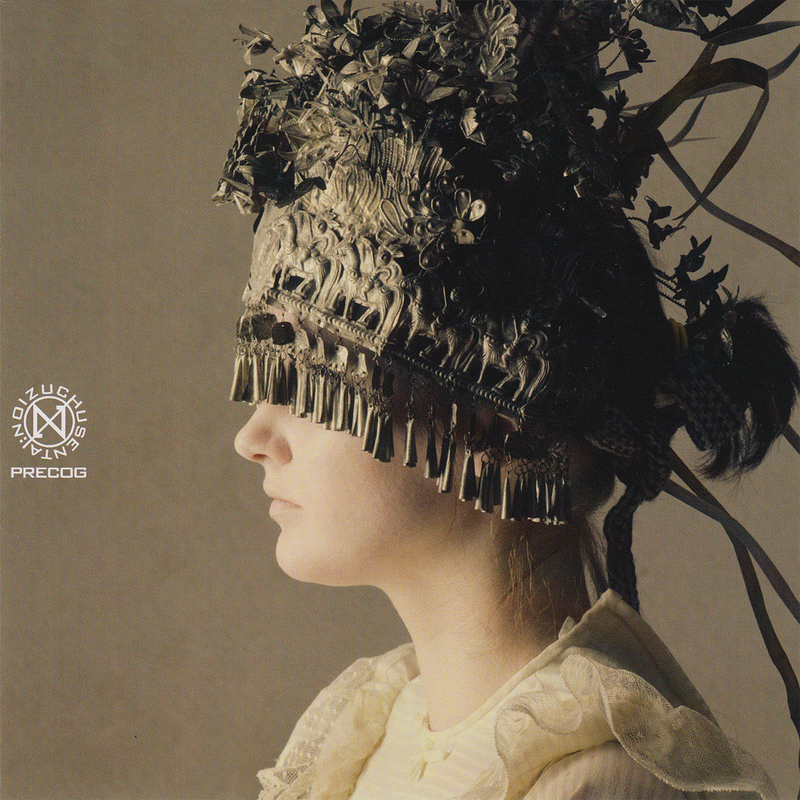 This release is limited to 1,000 copies. The first track, バトルカプセルから愛を込めて, has a longer intro which can only be found on this single. Many websites, including the official one, state that this single was released in August 2004, though the sleeve itself mentions that it was released on the 7th of April 2004 which is the same date as for the 宇宙戦隊プラズマ☆アミューズメント single. The date is very likely a printing error. A promotional CDr exists which, I think, you got for free when pre-ordering the single. It comes in a slim jewelcase with no artwork. The disc features over an hour of chit chat by the band where I think they are at least discussing this single. 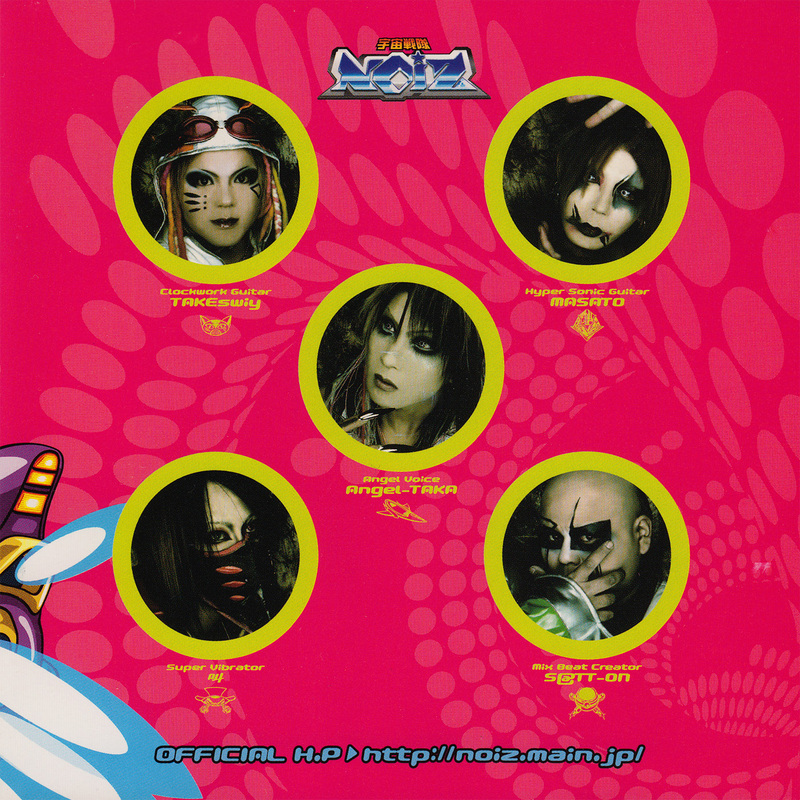 Second single released from their second album (which at that moment had yet to be released), issued on CD with an obi, as a digi-pack and has a small poster with images and lyrics. 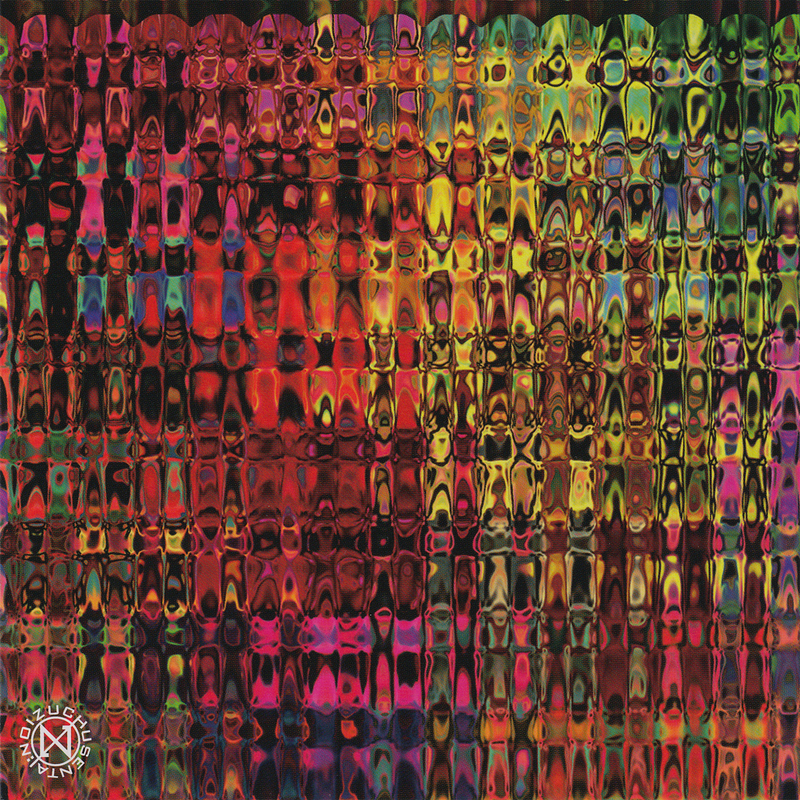 This release is limited to 1,000 copies. 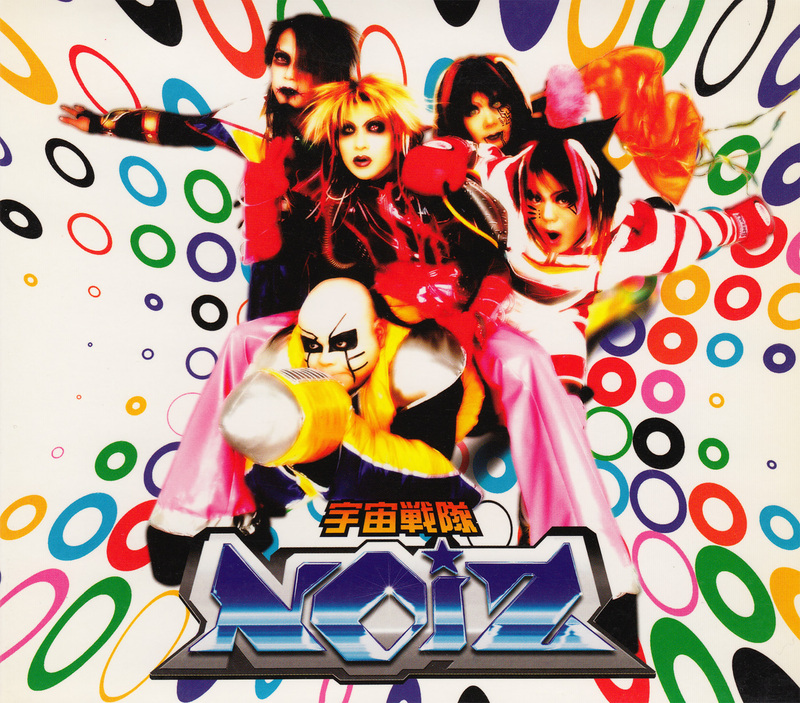 Their first single released by a record company, issued on CD with an obi, as a digi-pack and has a small poster with images and lyrics. 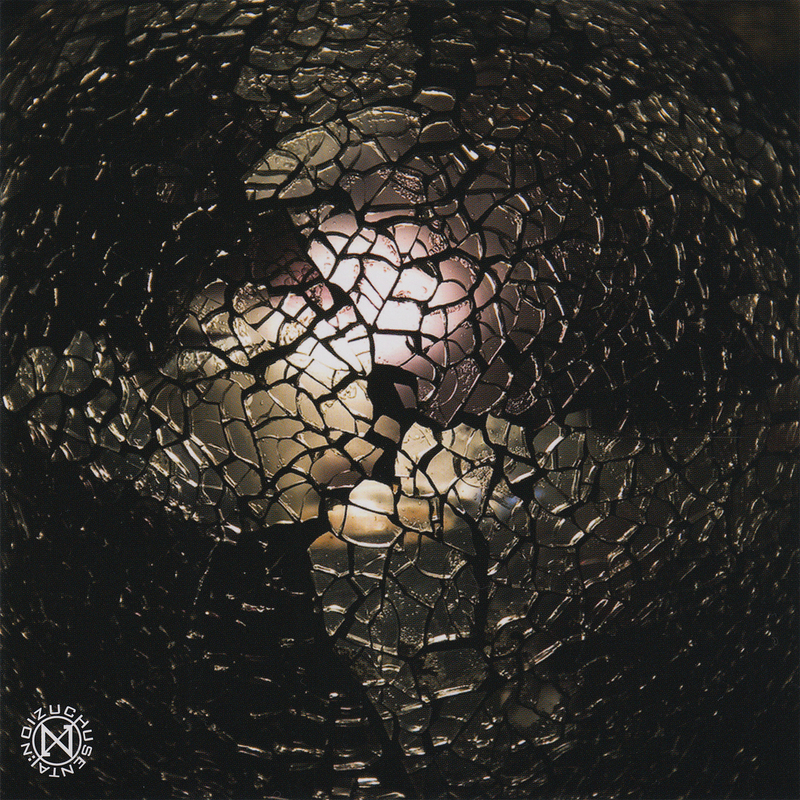 This release is limited to 1,000 copies. 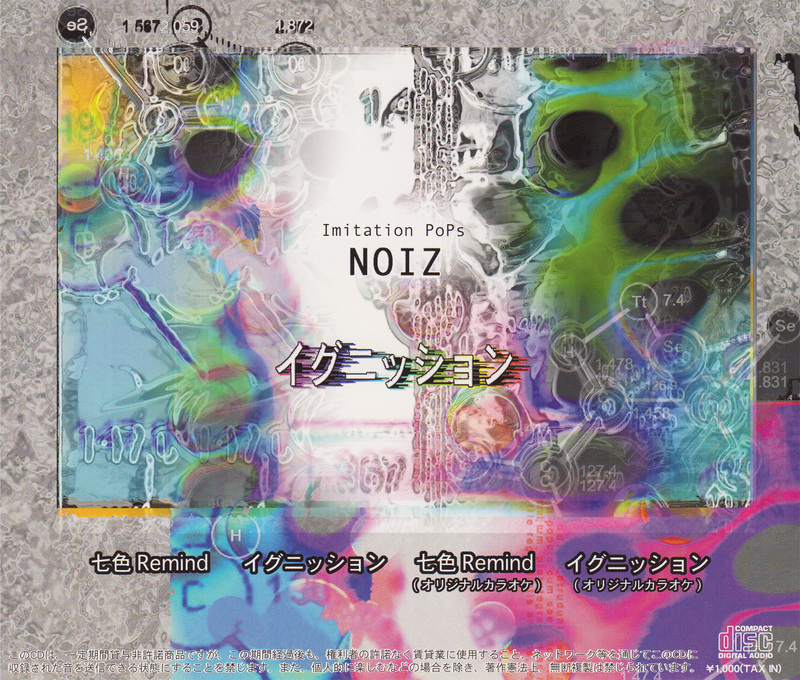 This is also the first single release that has the bandname Imitation PoPs 宇宙戦隊NOIZ. 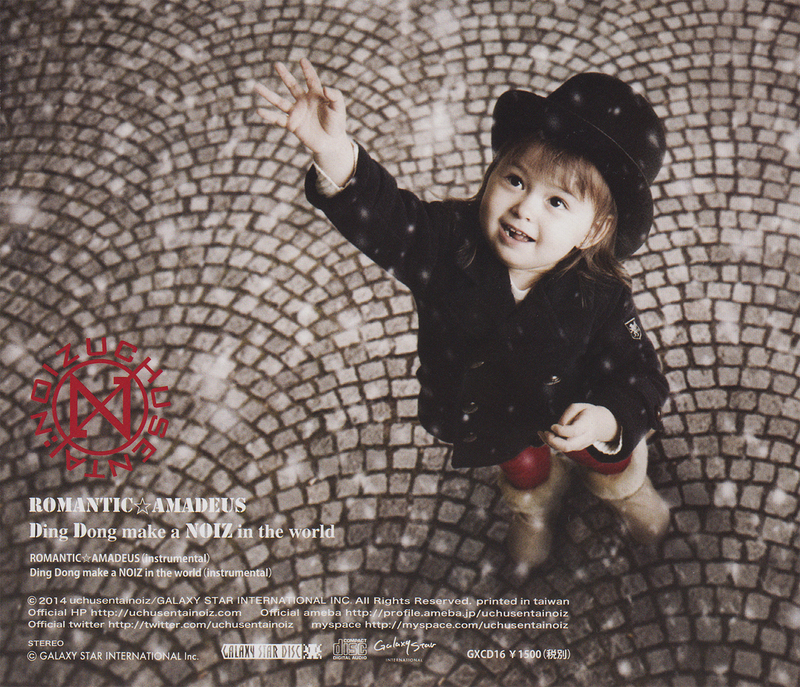 Third and last single from a serie of three, released on CD with an obi in February 2003. 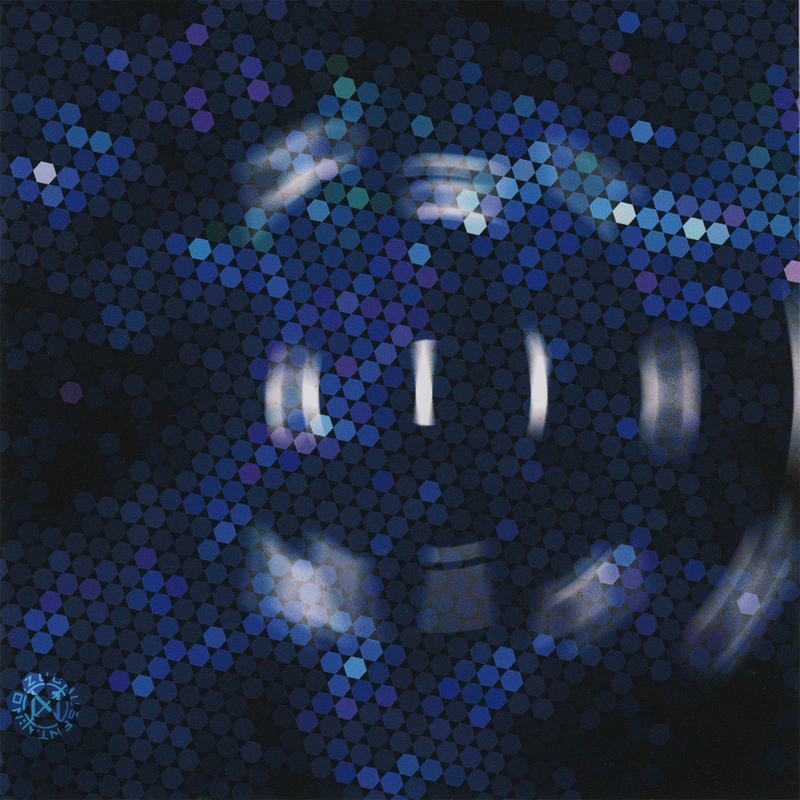 All of the tracks are only on this single. The last two tracks are once again instrumental/karaoke versions. 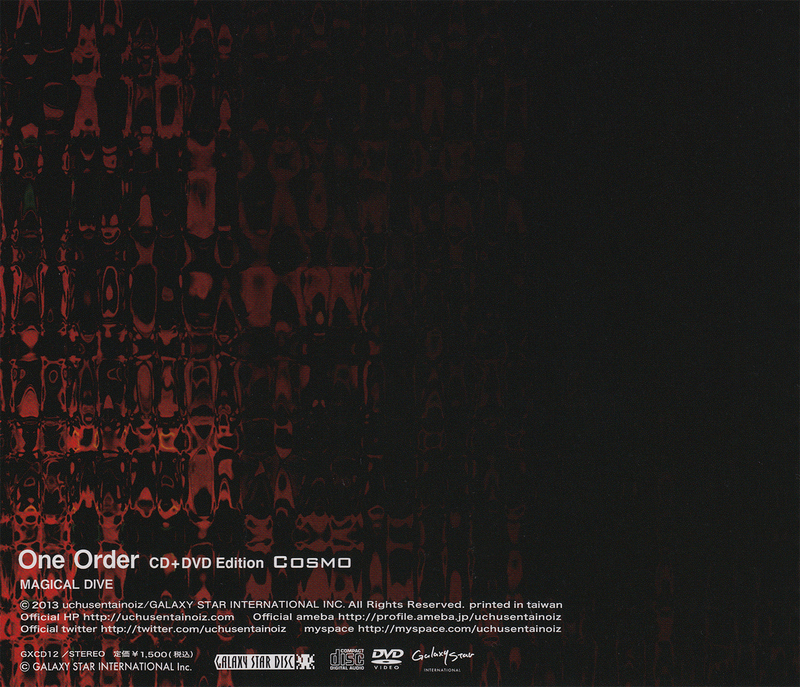 Second single from a serie of three, released on CD with an obi in January 2003. 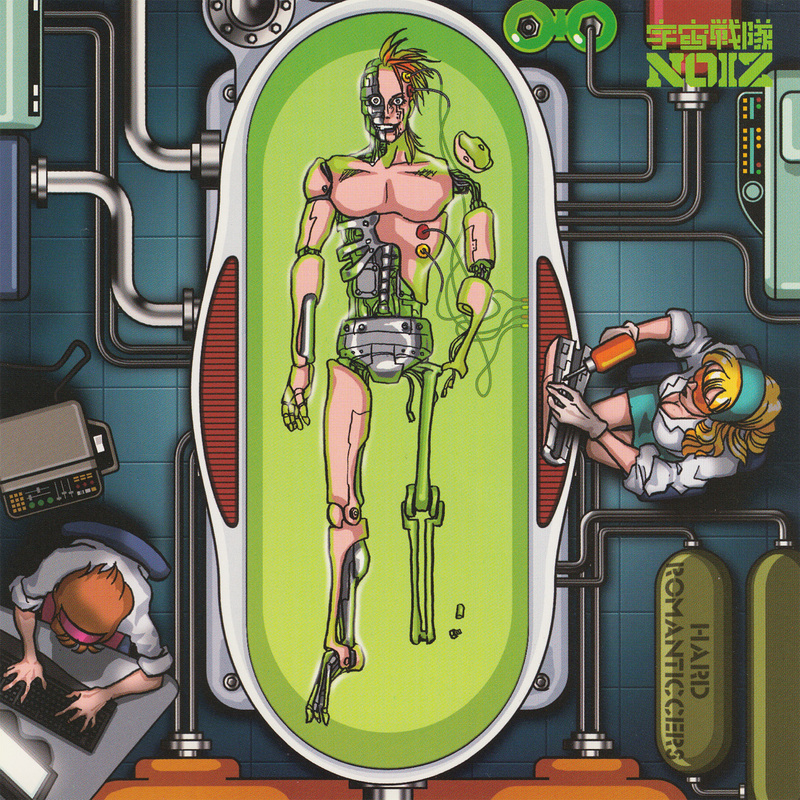 All of the tracks are only on this single, although イグニッション is an early version of Igni+ioN. 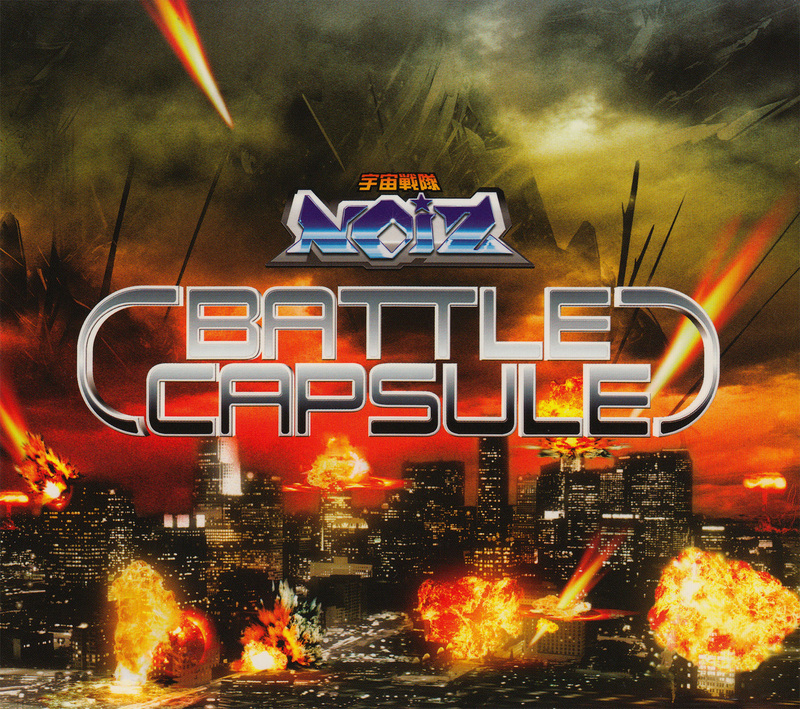 The last two tracks are once again instrumental/karaoke versions. 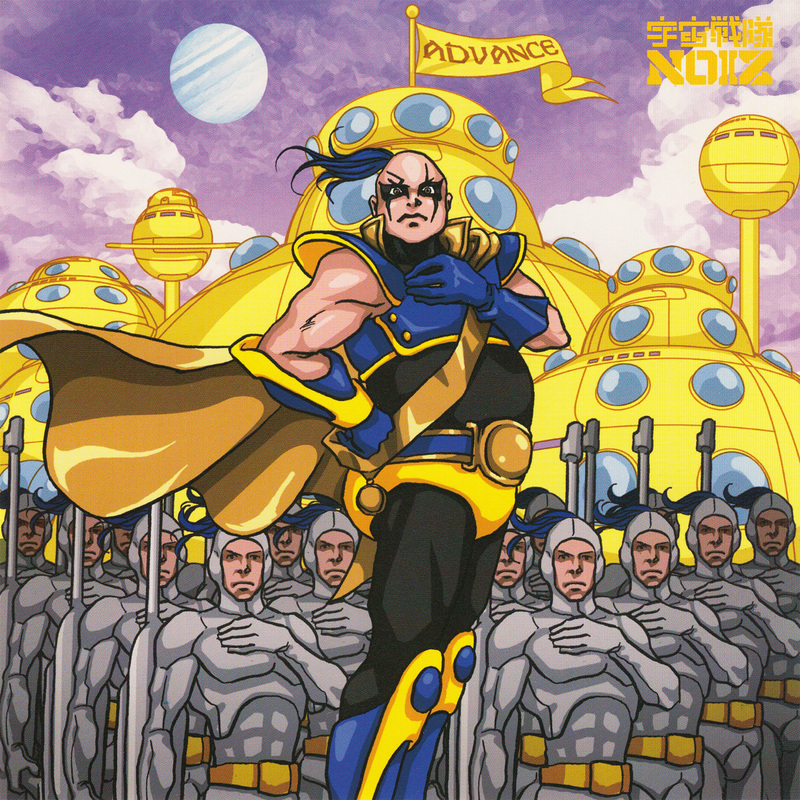 An early single from December 2002, released on CD with an obi. (A+B)No.0-QT? was later slightly re-recorded and released on their debut album. 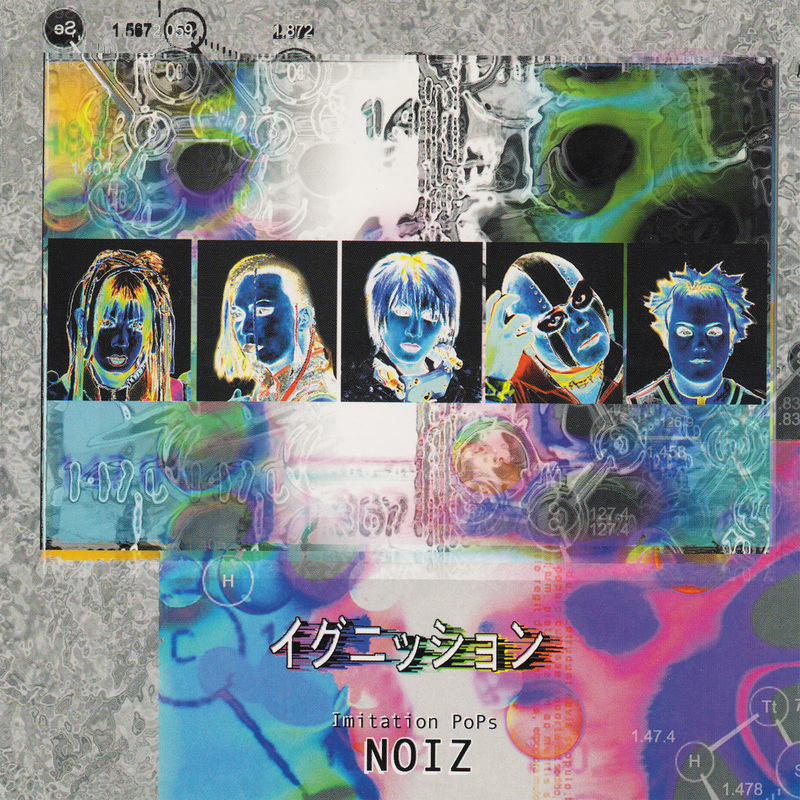 The group called themselves Imitation PoPs NOIZ as of this release. BELIEVE was only released on this single. 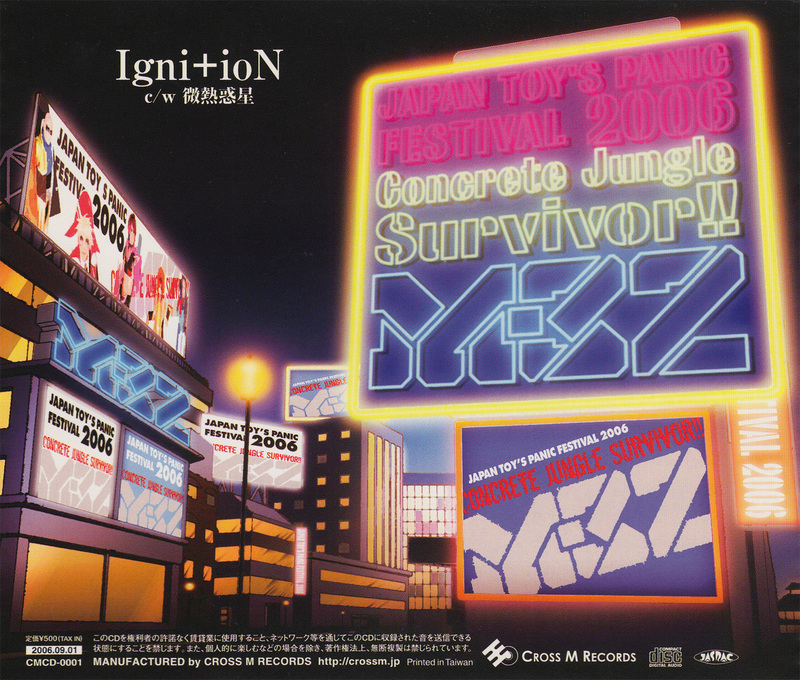 The other two tracks are instrumental versions, or, when you translate the Japanese subtitles correctly, are actually karaoke versions. 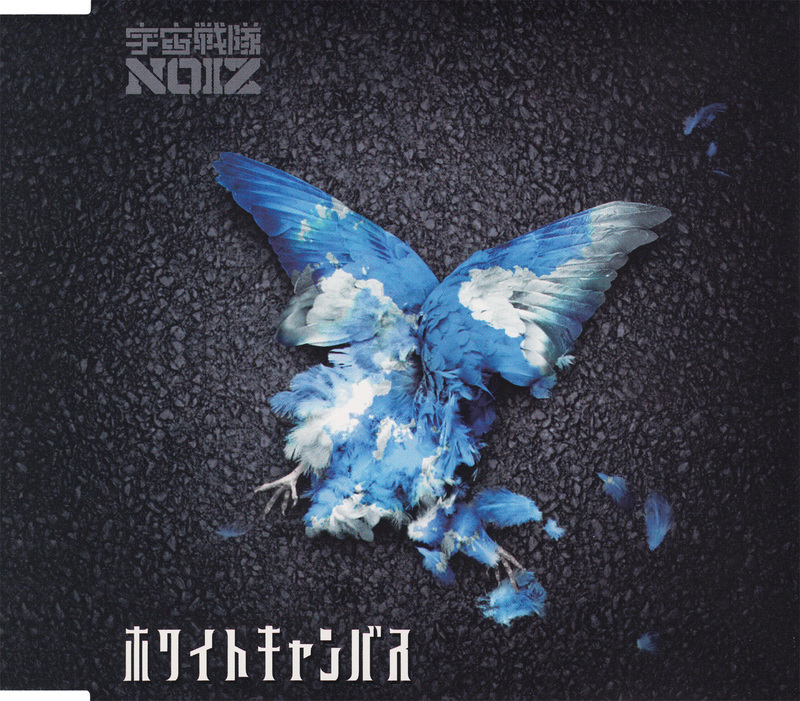 This single is being seen as their first official single release where they were still called NOIZ. It was released on CD in a slim jewelcase with an obi. It is quite rare these days. 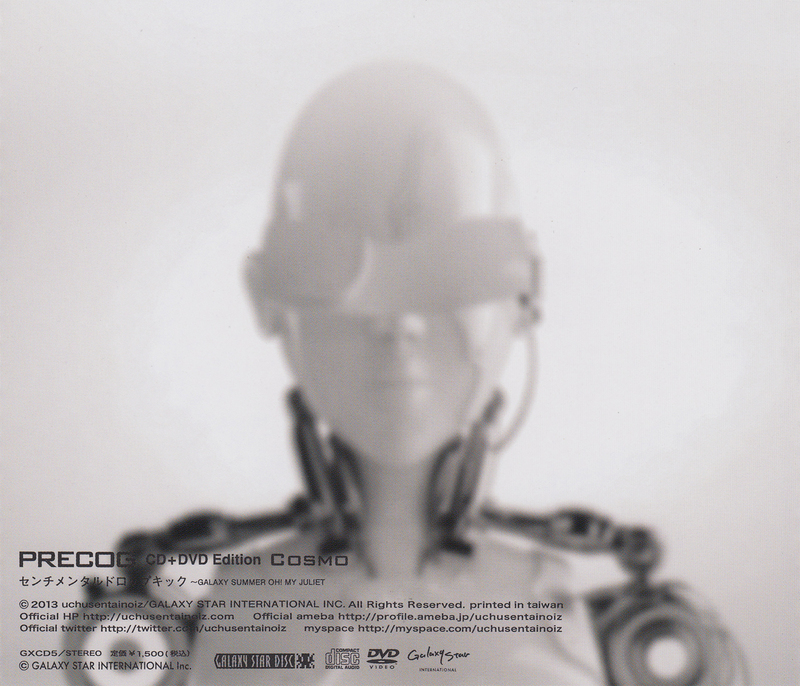 コマンドNo.0069 was re-recorded and re-released on their second album in 2004. R.A.M. FISH was re-recorded and re-released on their debut album in 2003. 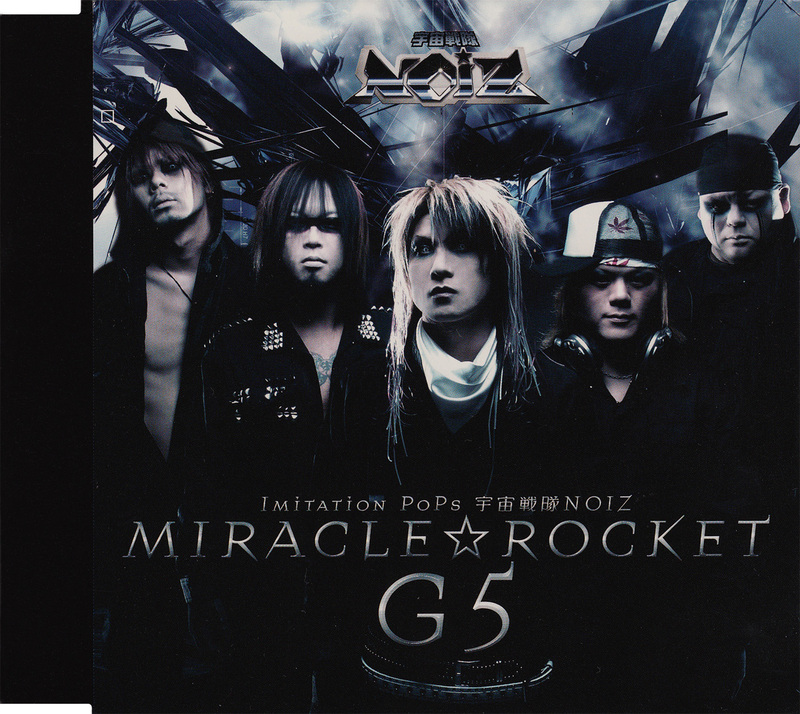 The first two songs really differ from the re-recorded versions. 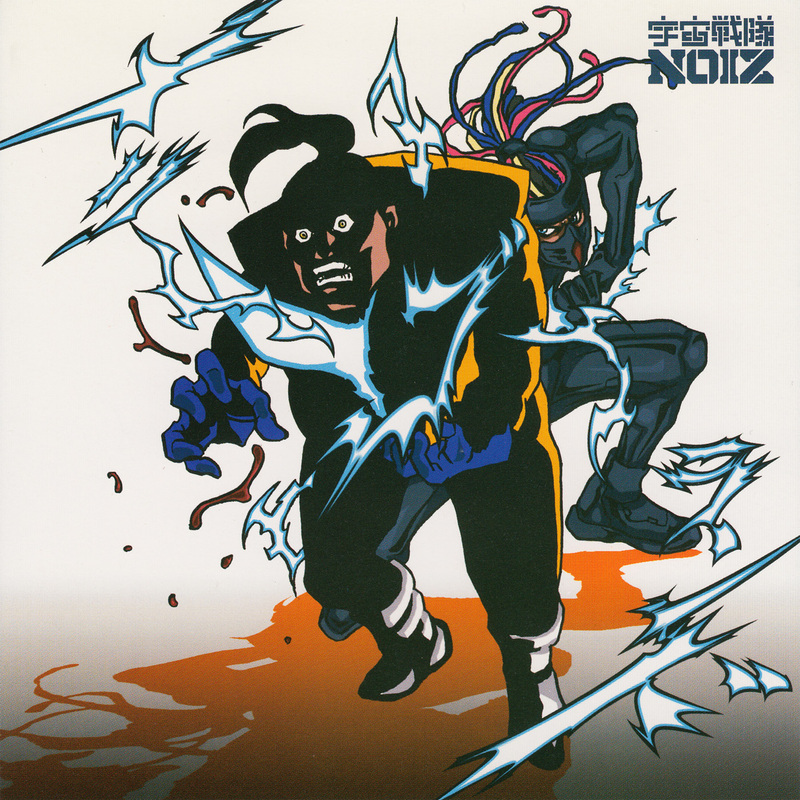 The third track has only been released on this single.